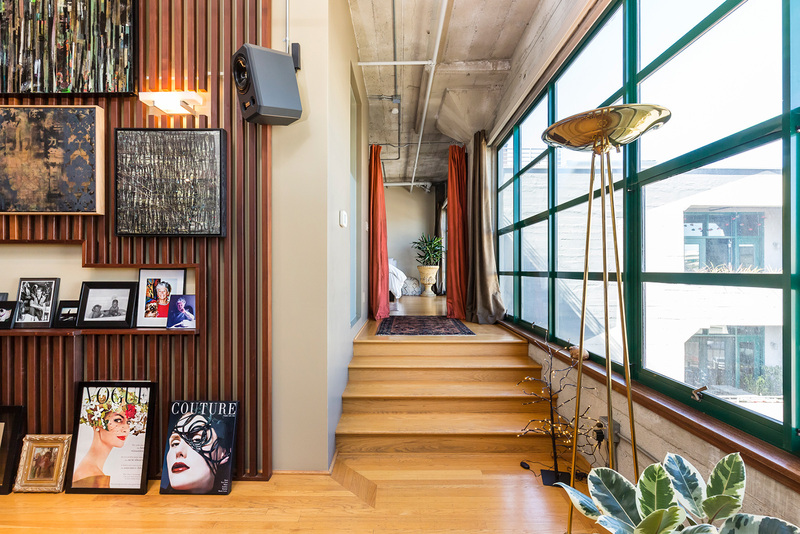 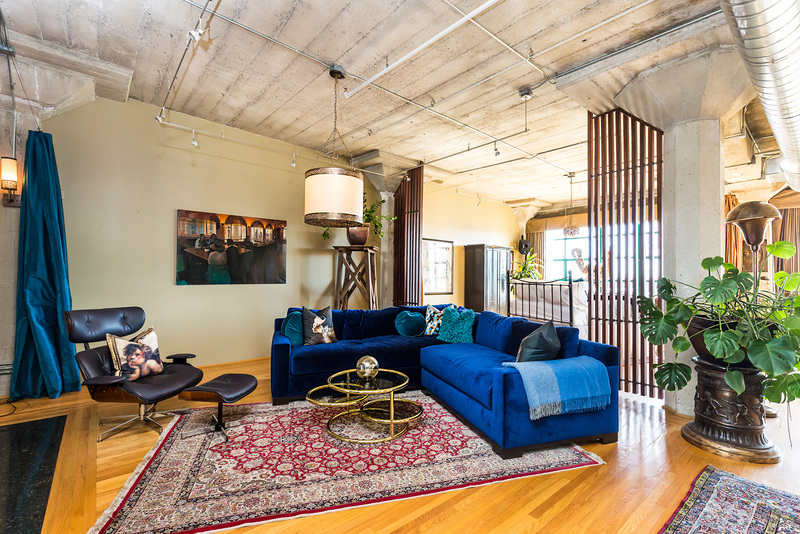 It’s easy to see why this breathtaking Oakland loft was one of three showcased on the pilot episode of ”The Loft Style” starring HGTV’s Stephanie Cook. 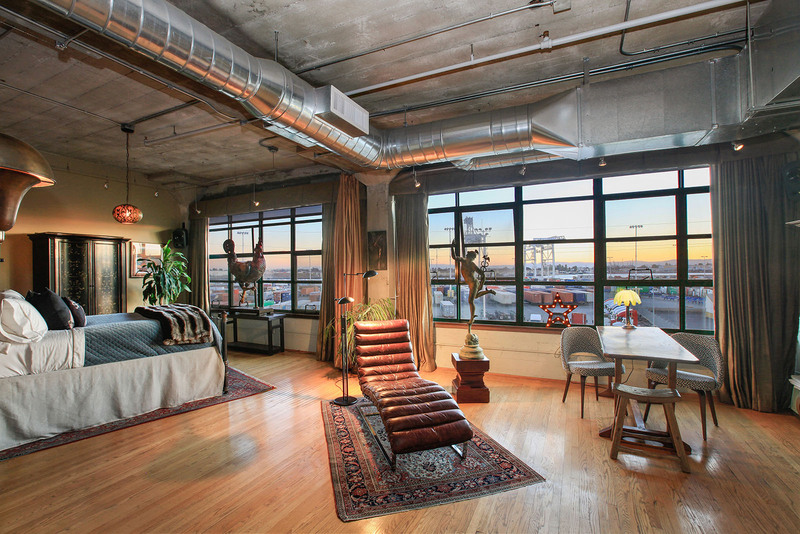 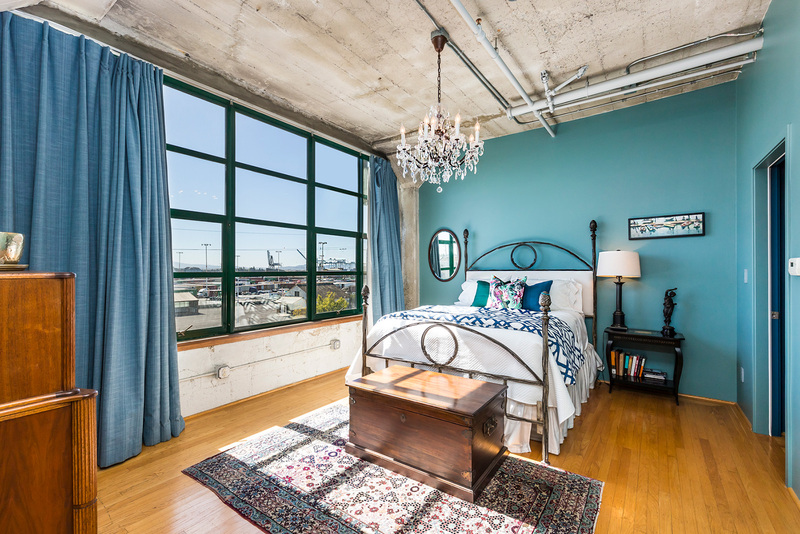 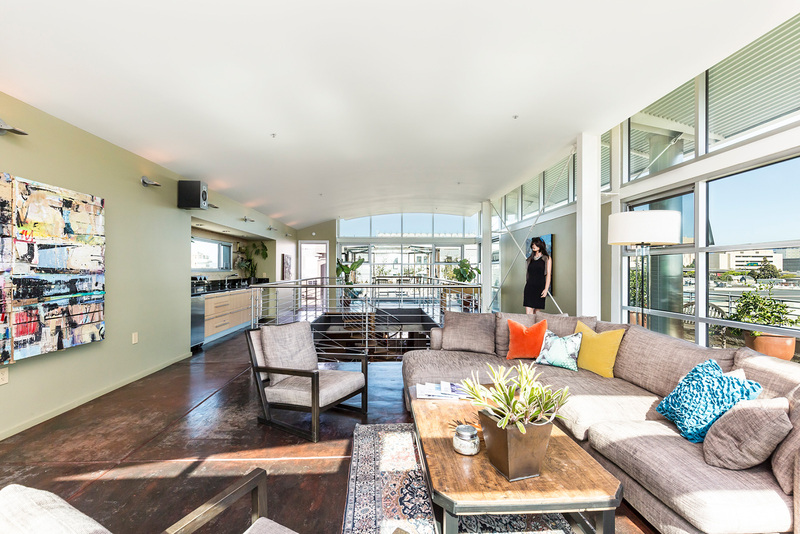 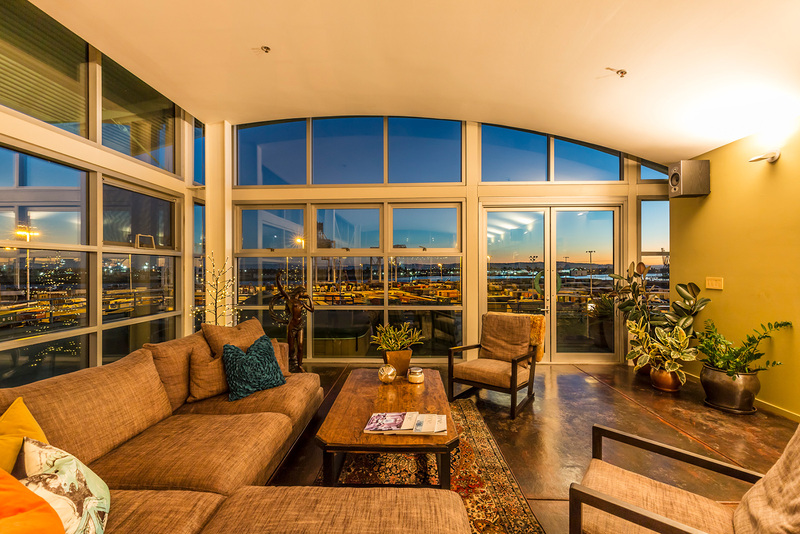 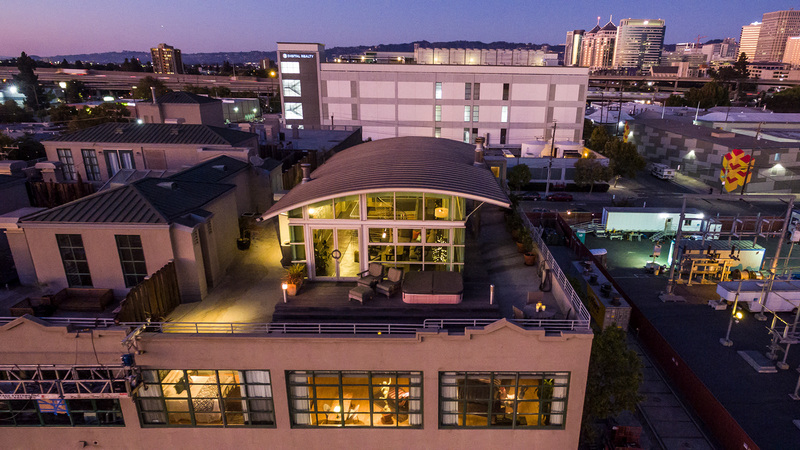 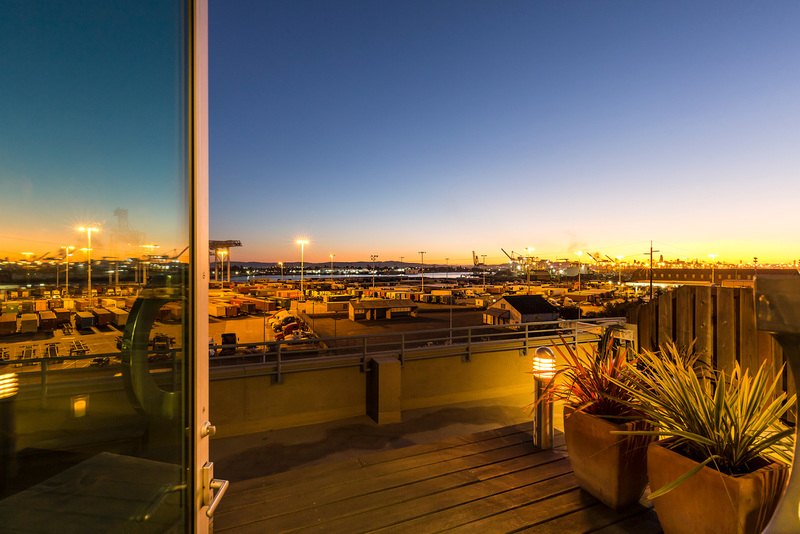 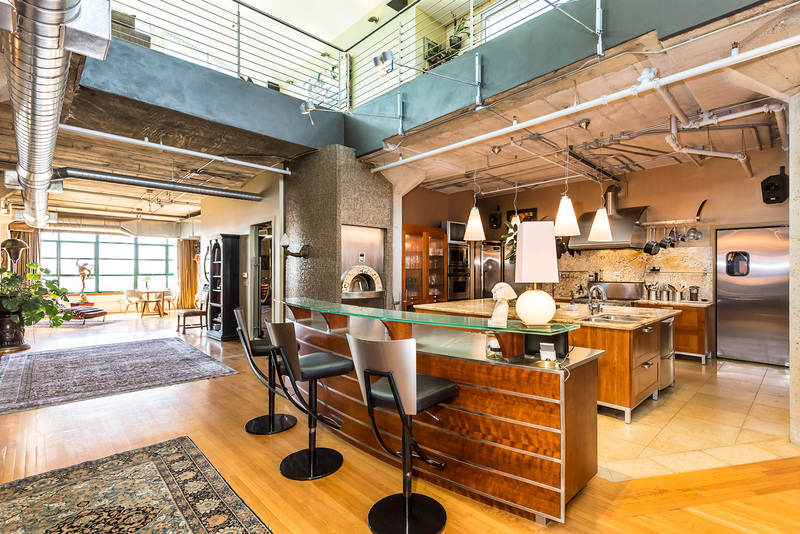 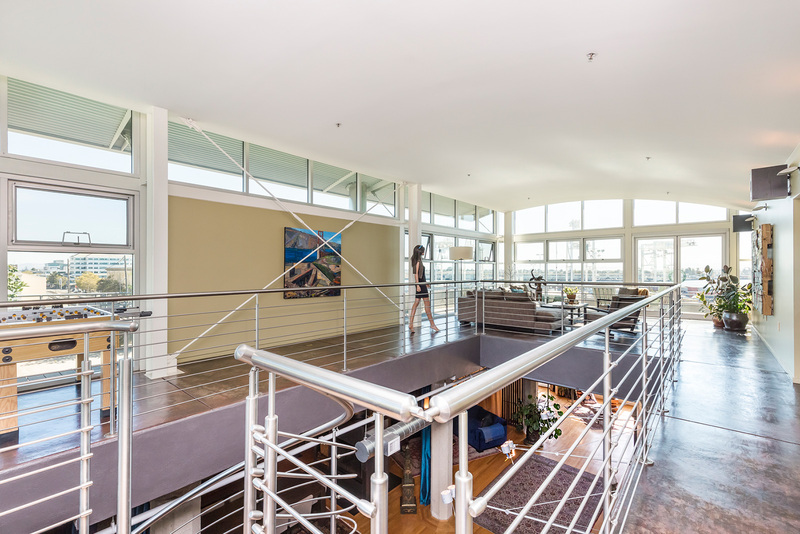 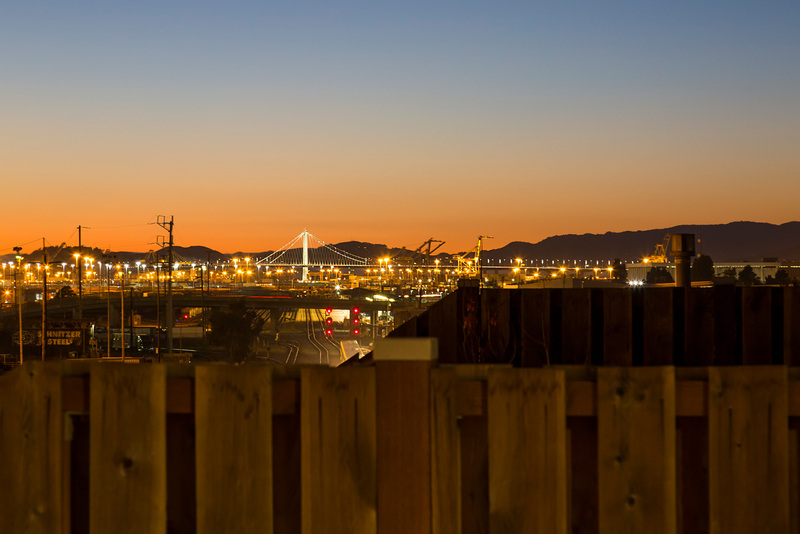 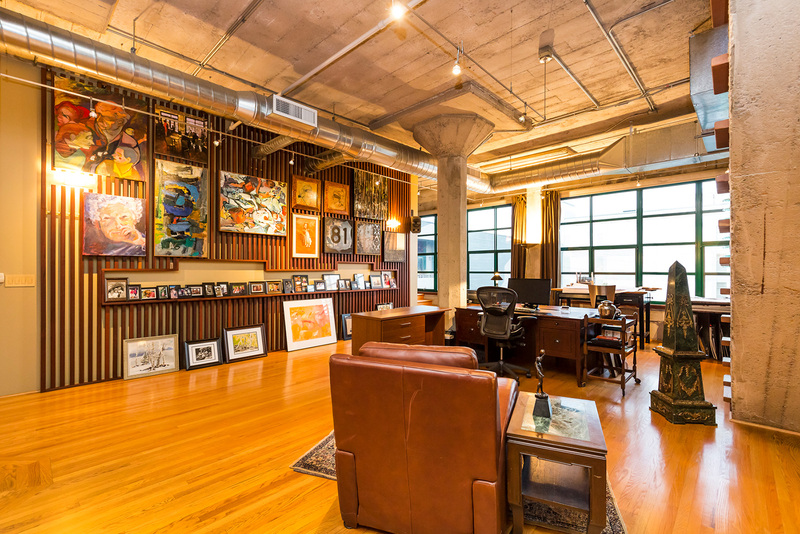 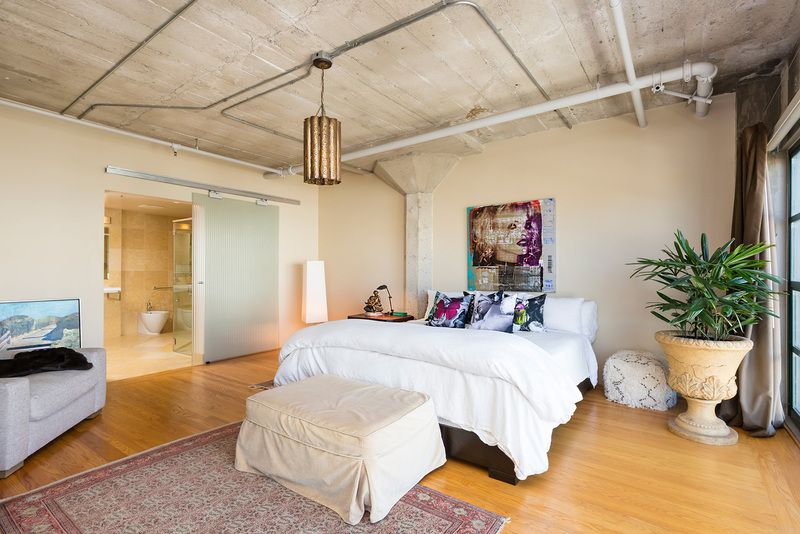 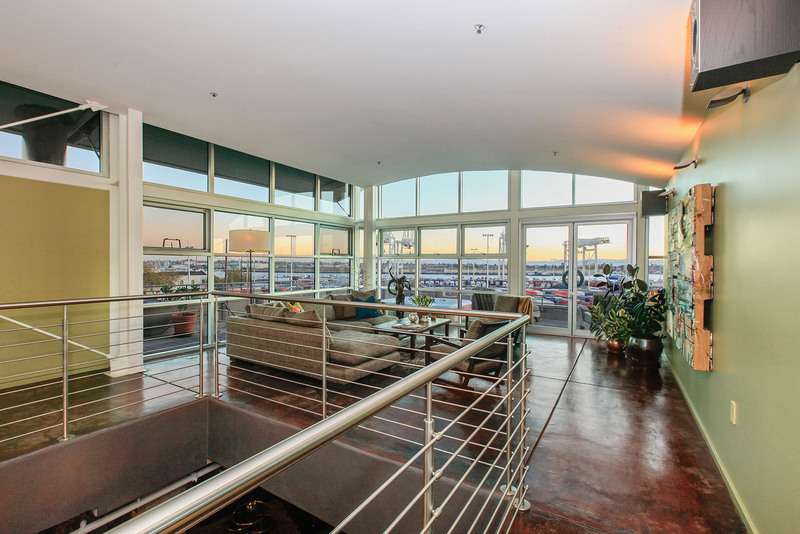 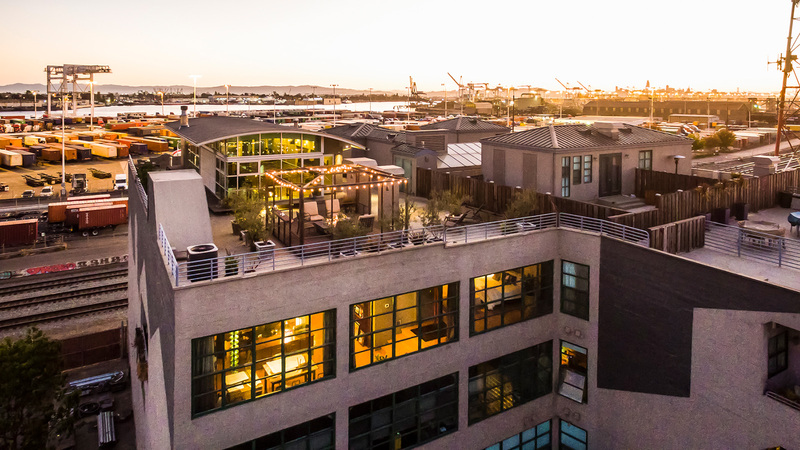 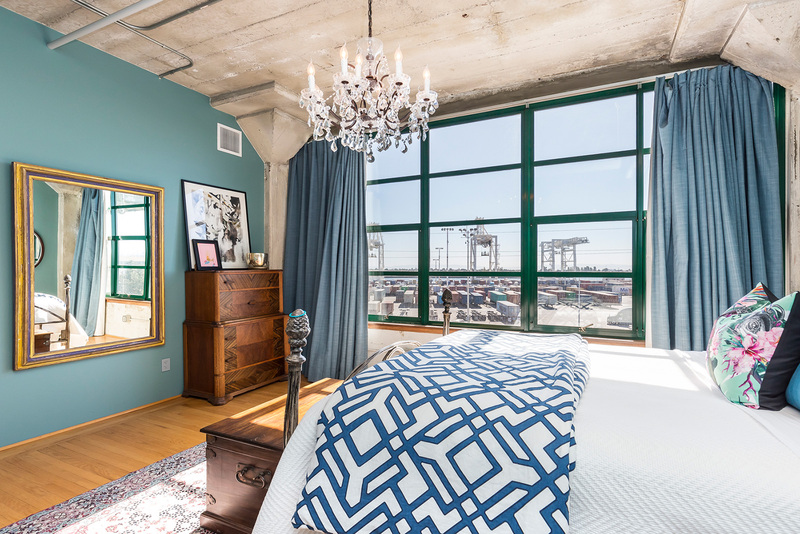 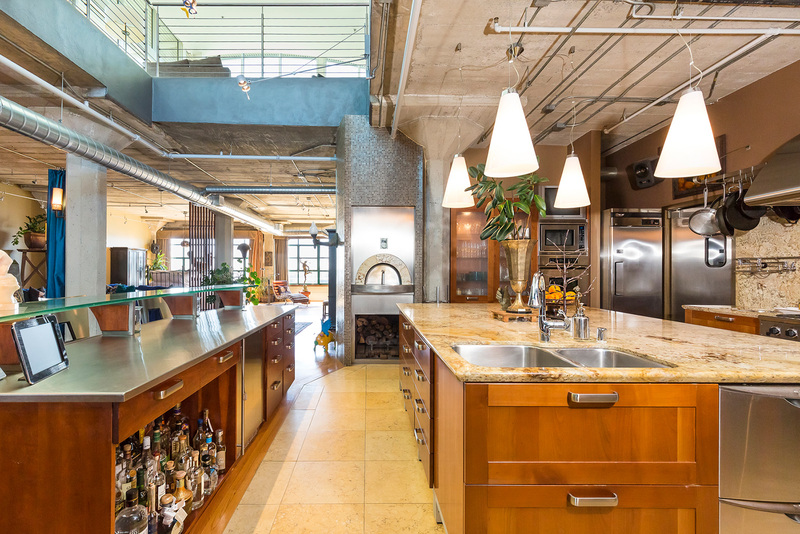 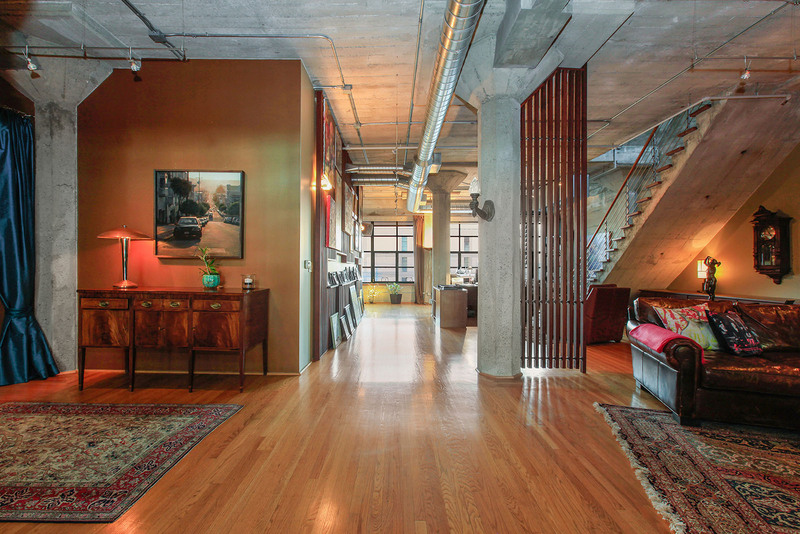 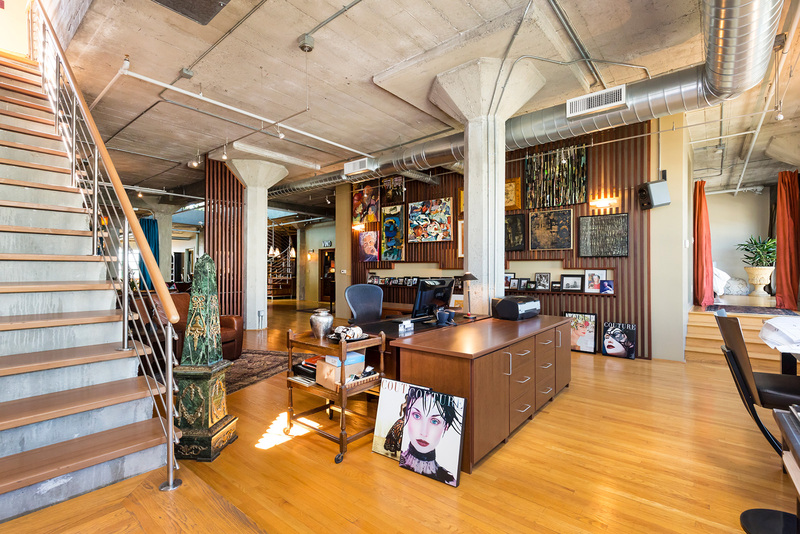 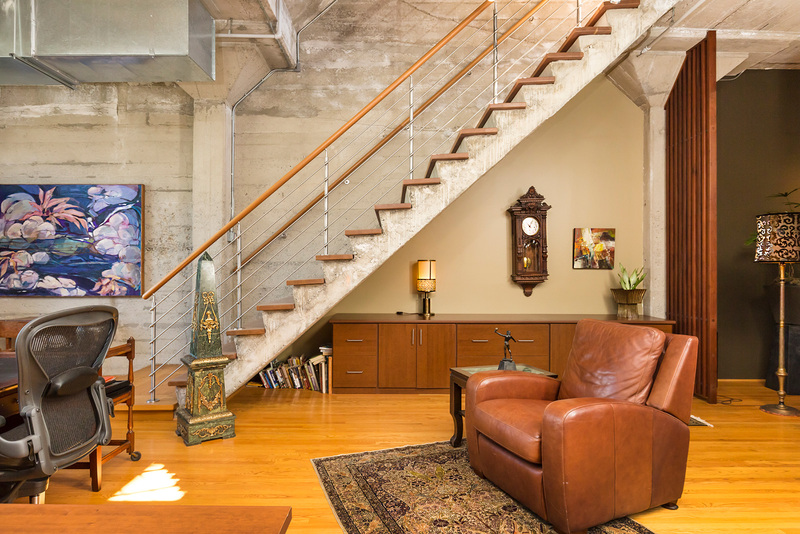 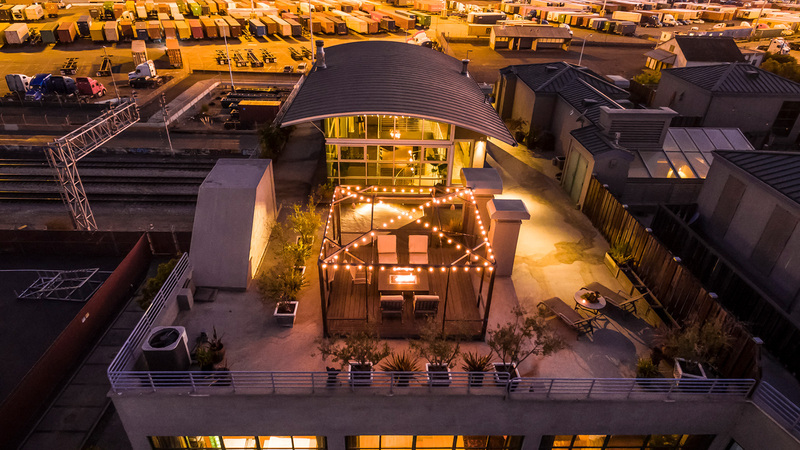 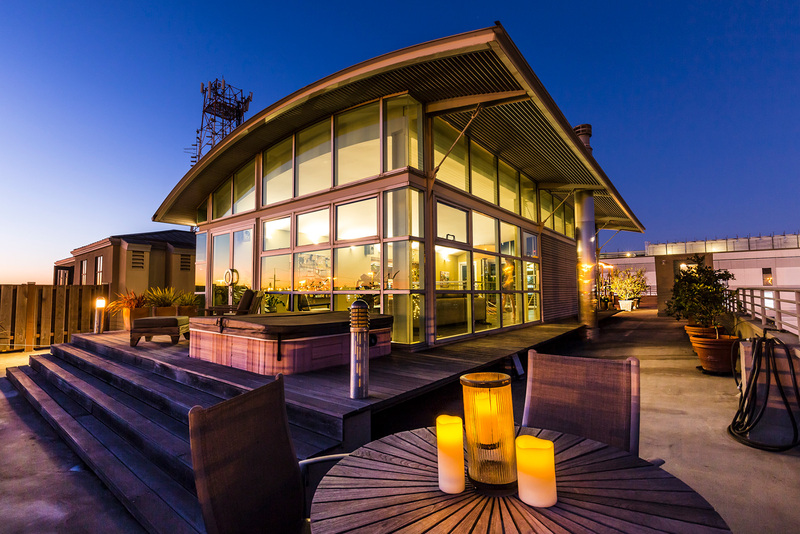 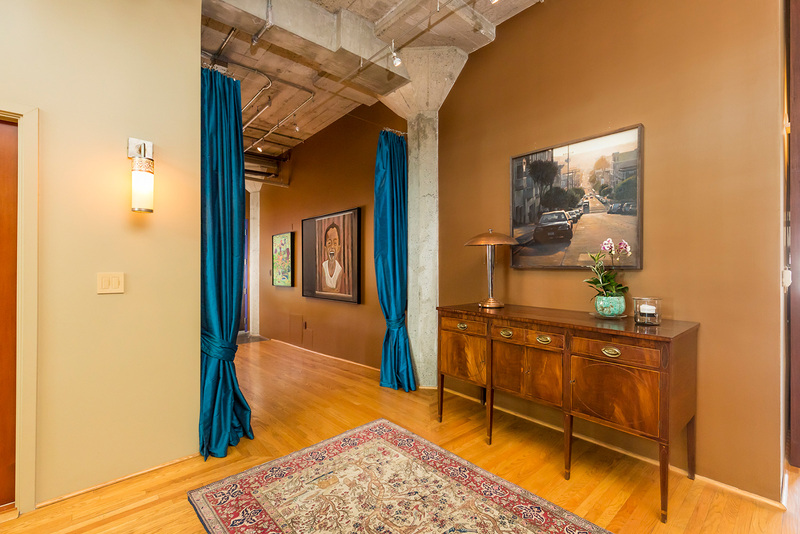 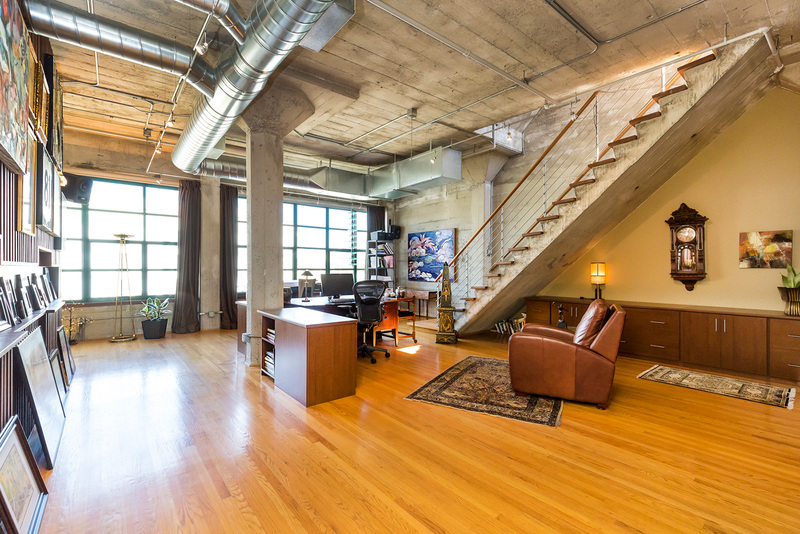 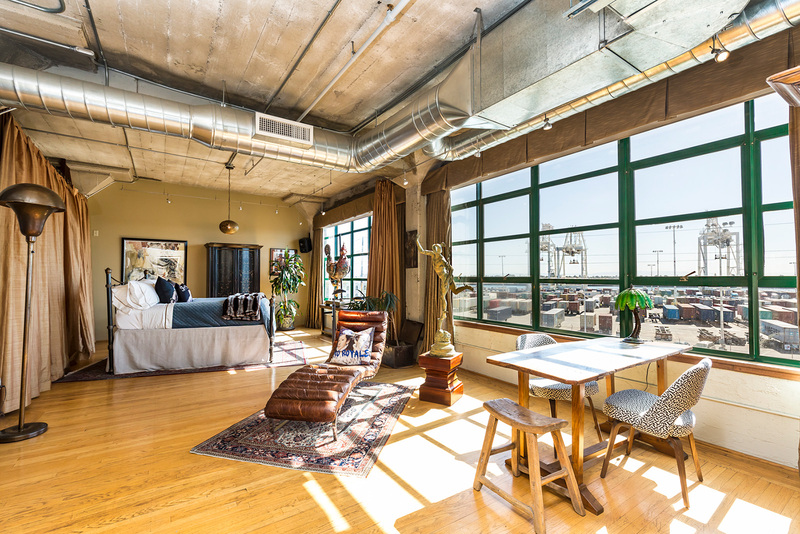 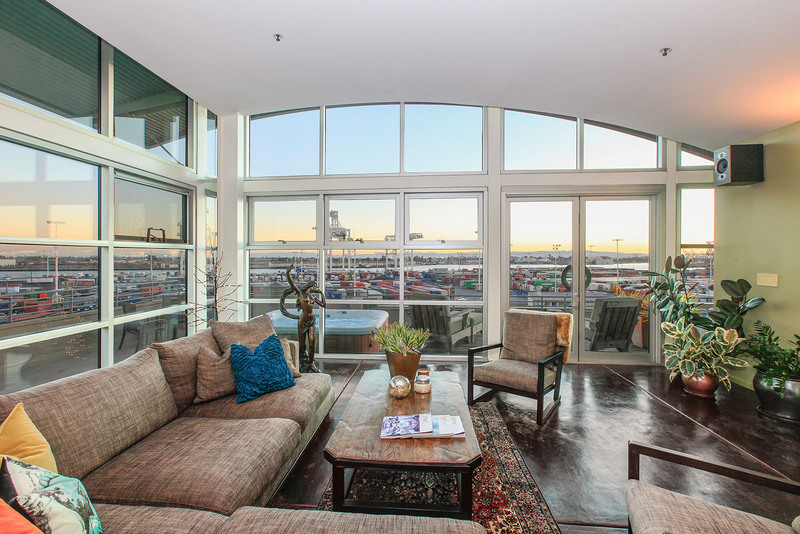 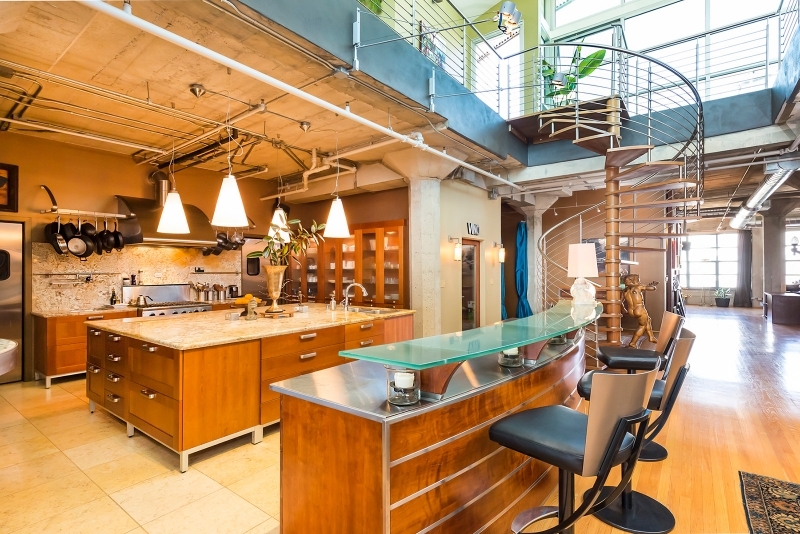 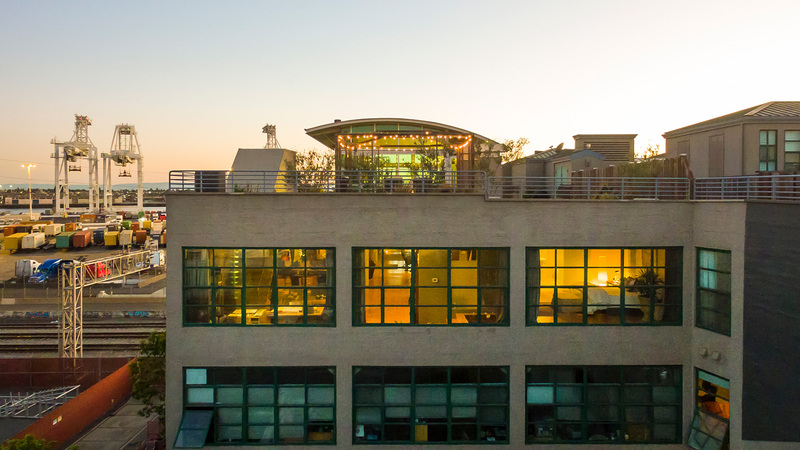 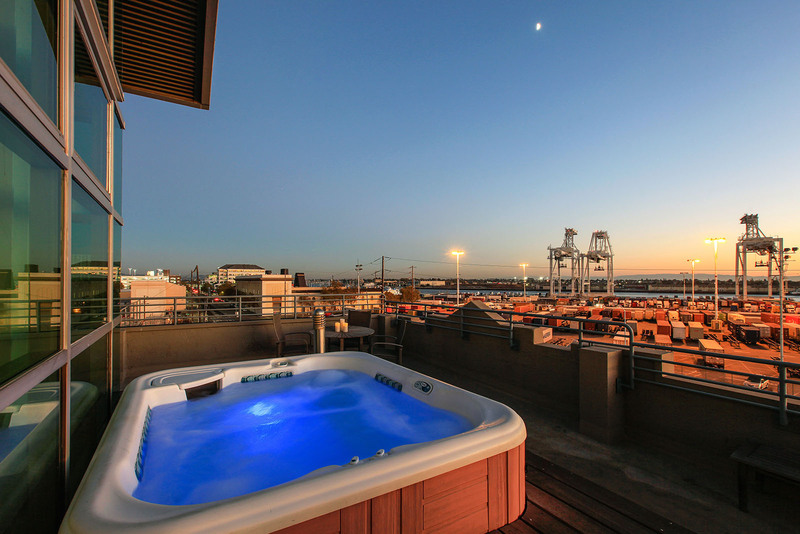 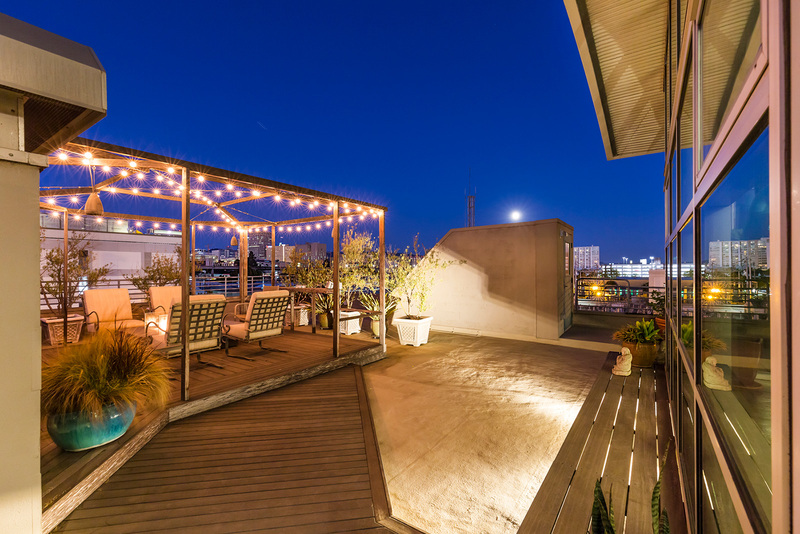 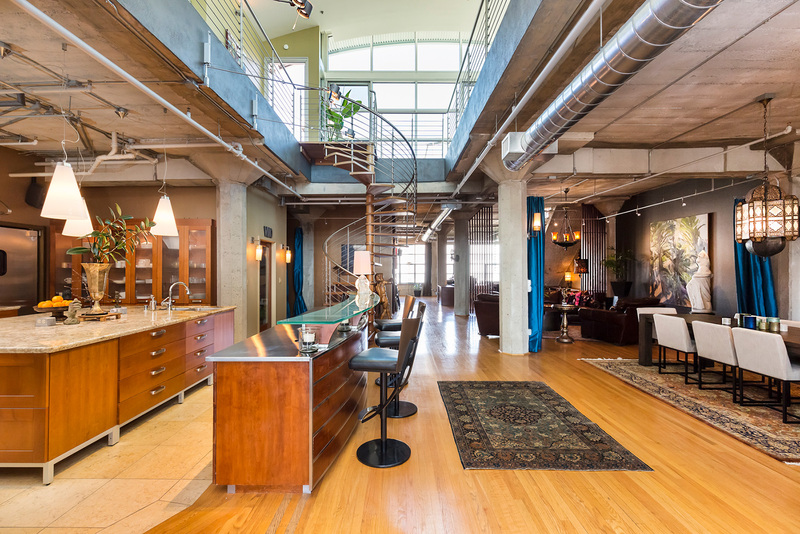 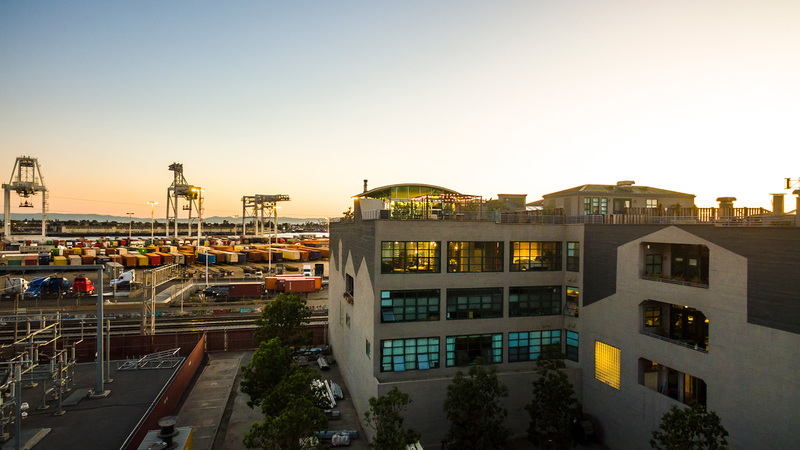 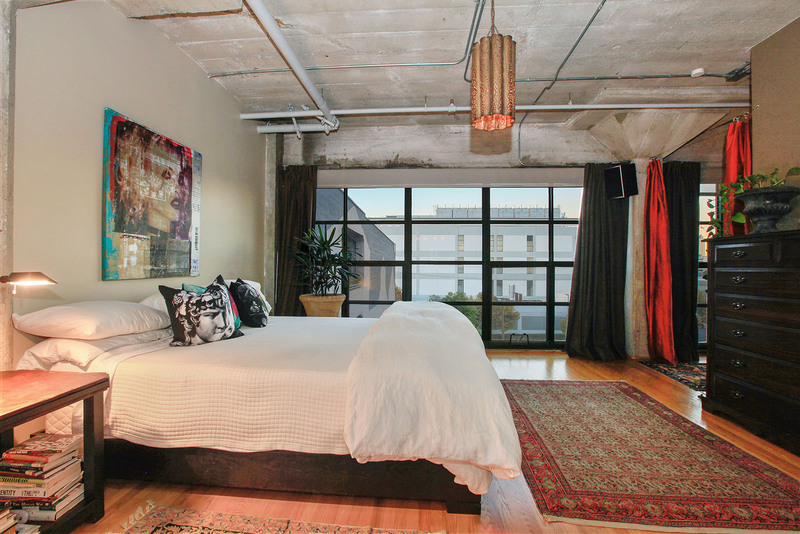 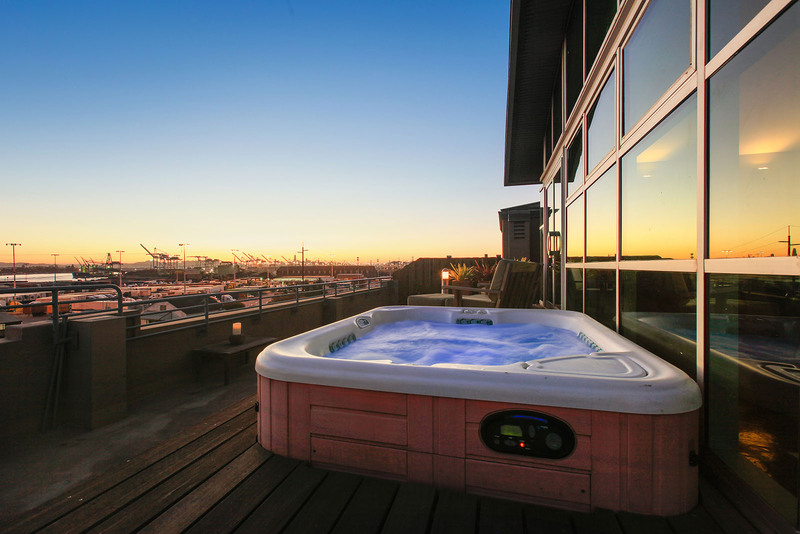 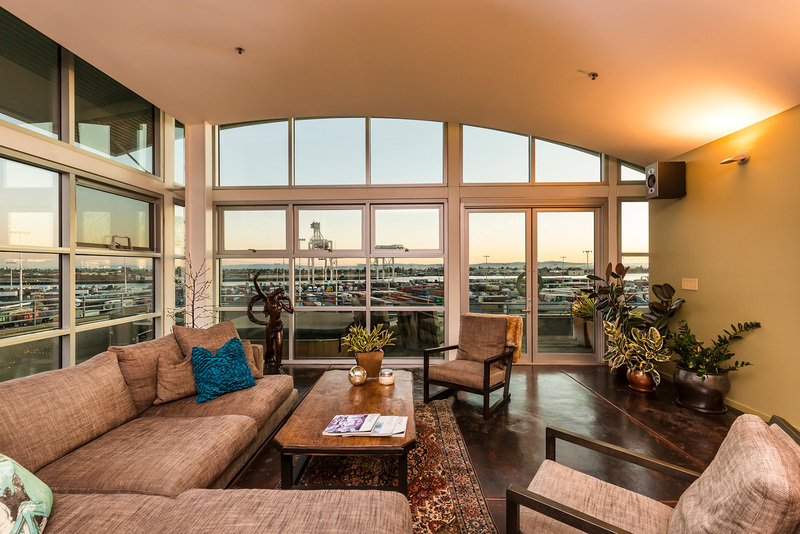 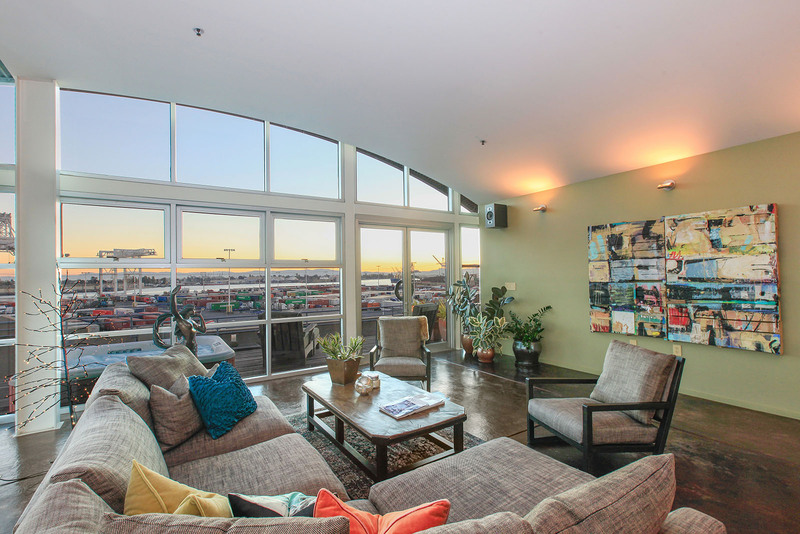 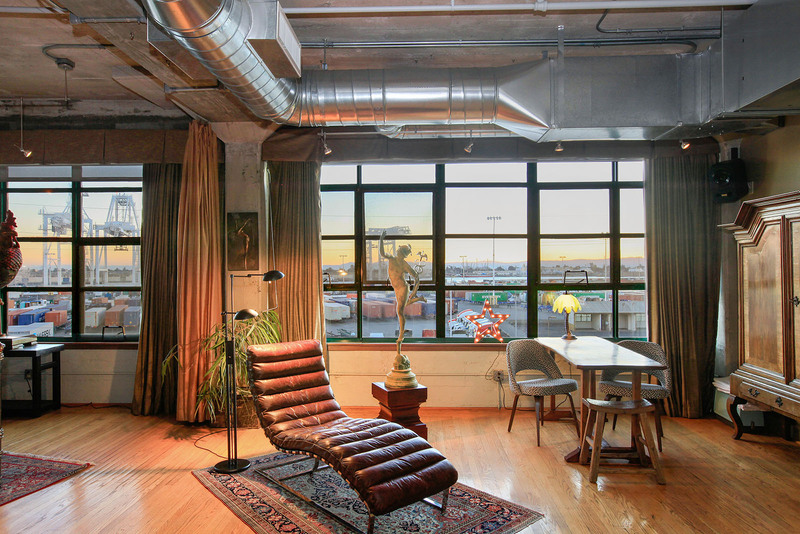 Located on the western edge of Jack London Square, Penthouse Loft 405 overlooks the Port of Oakland and San Francisco Bay. 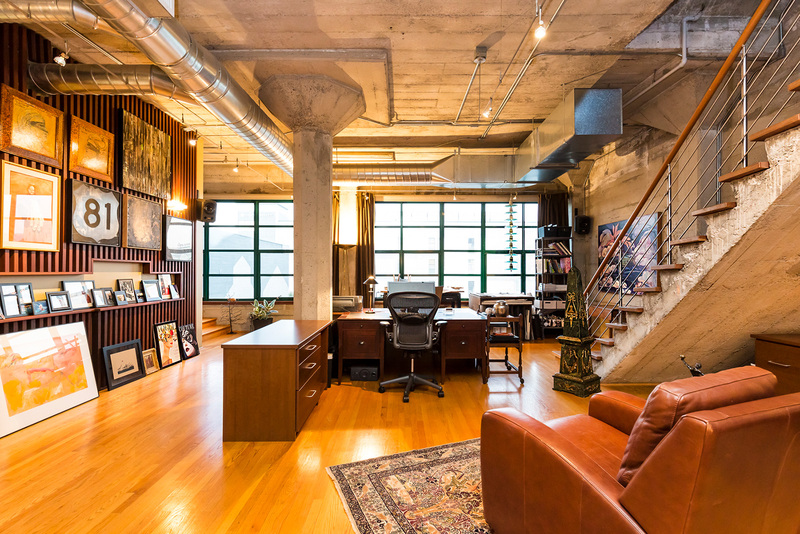 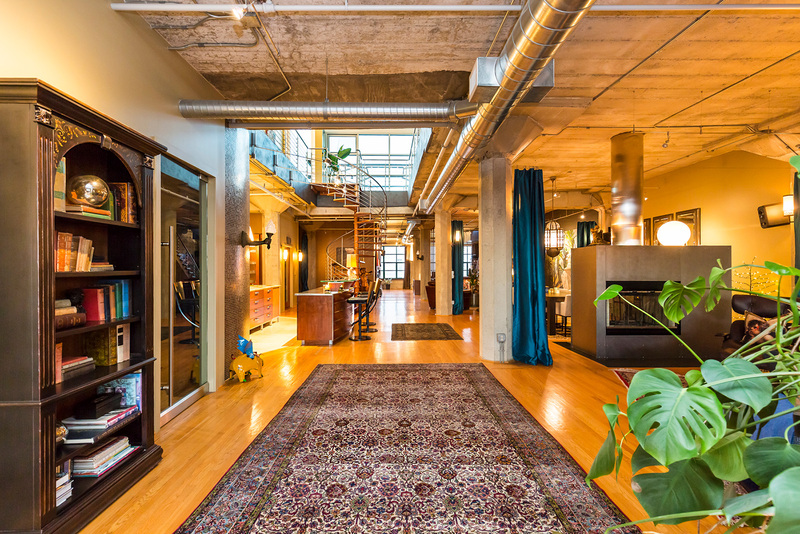 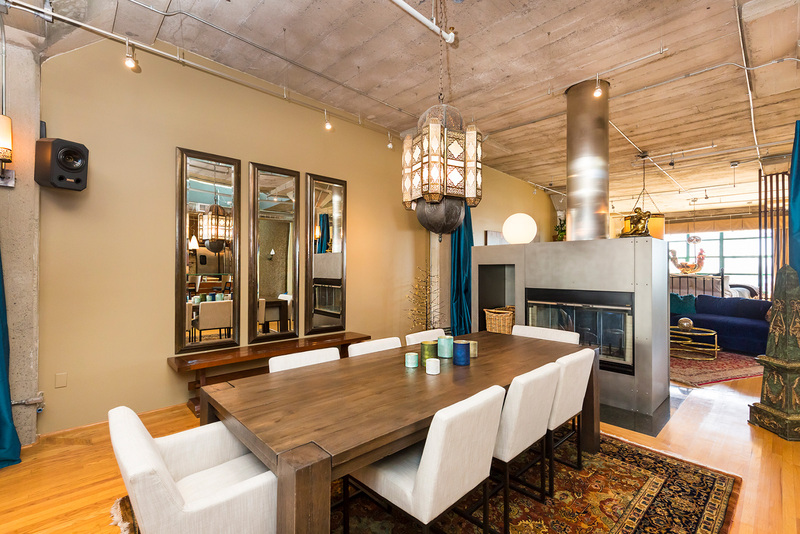 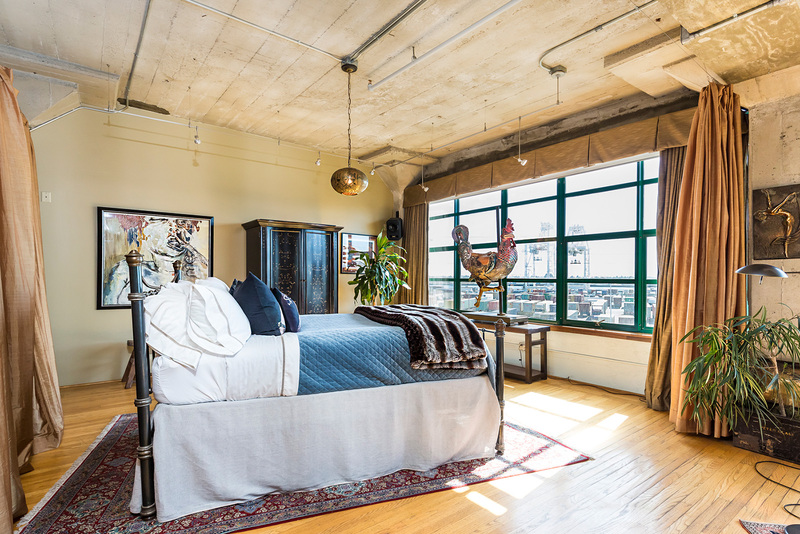 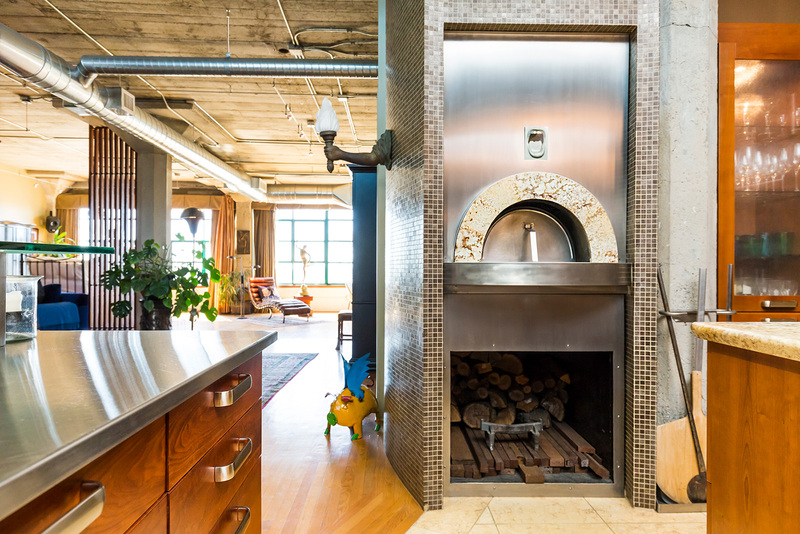 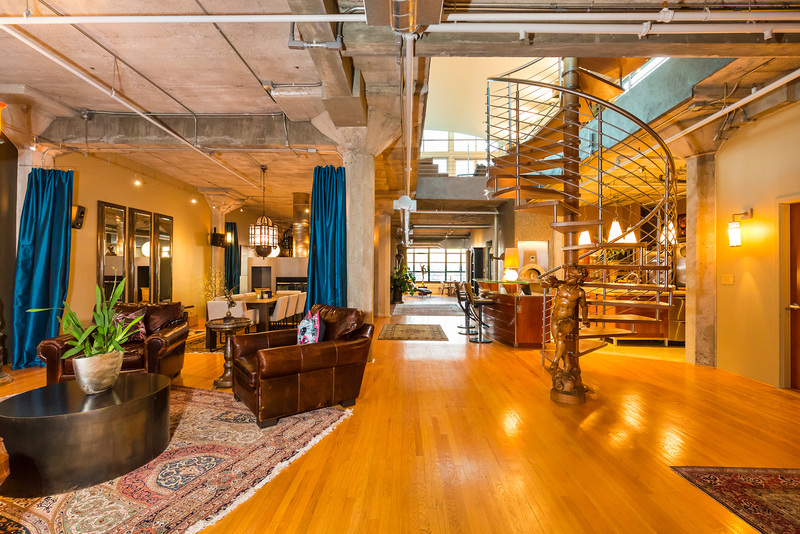 Converted from a historic 1920’s building (the Phoenix Iron Works foundry, which created manhole covers and grates still in use today), this residence combines trademark loft elements with hand-selected finishes. 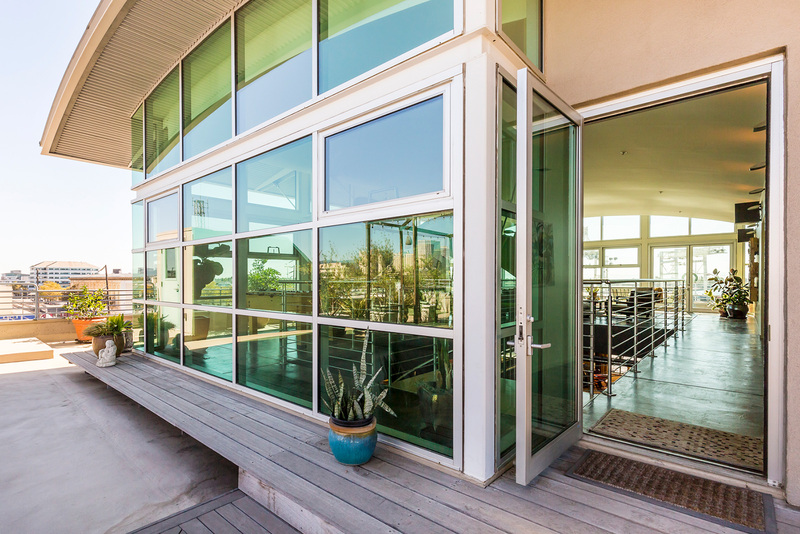 The interior features wide-open spaces, large-scale windows, and solid concrete walls with an aluminum and glass penthouse designed by Tom, Eliot and Fisch. 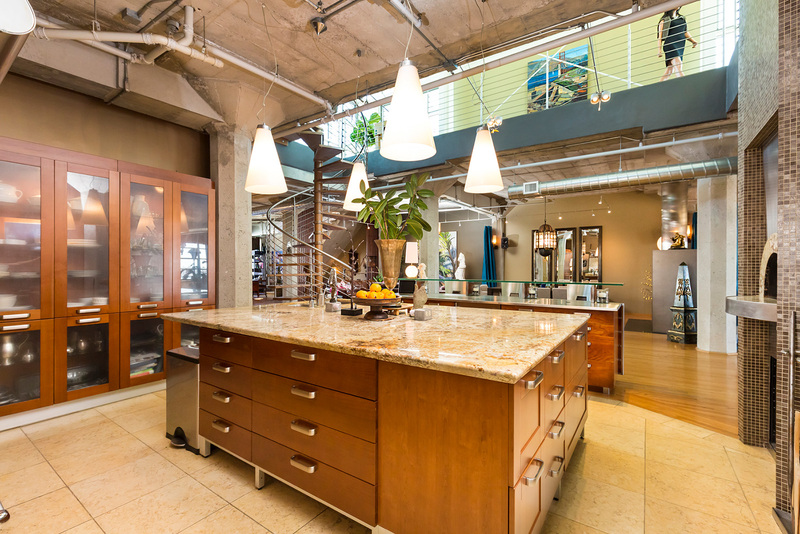 These dramatic elements are balanced with warm Italian cherry cabinetry, Italian granite countertops, oak and limestone floorings, and thoughtful lighting throughout. 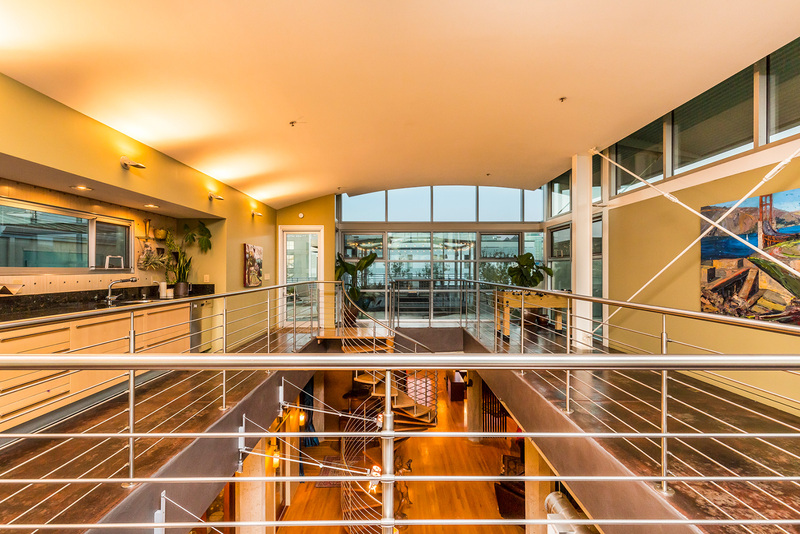 The formal entry leads to the great room, which is set apart by its 11.5’ ceilings and custom Italian spiral staircase. 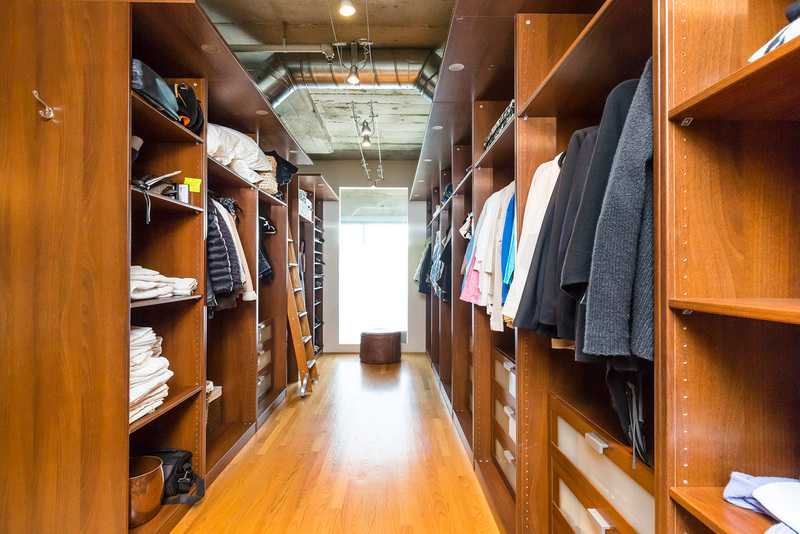 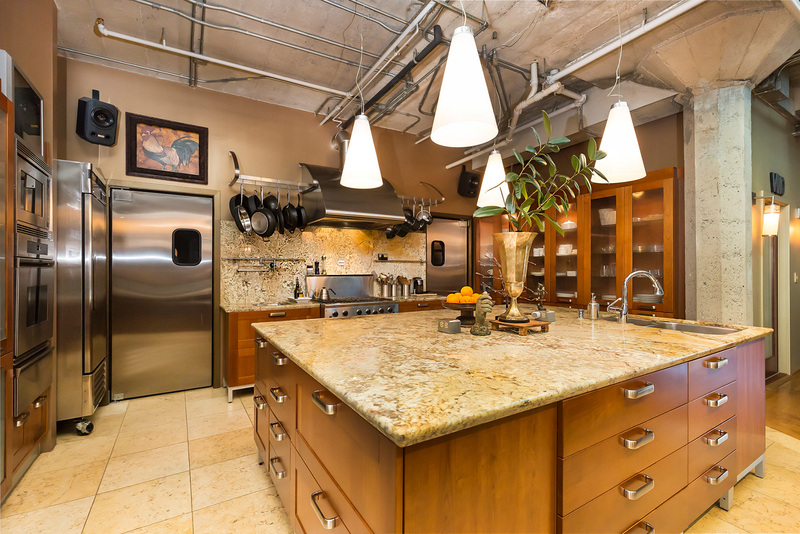 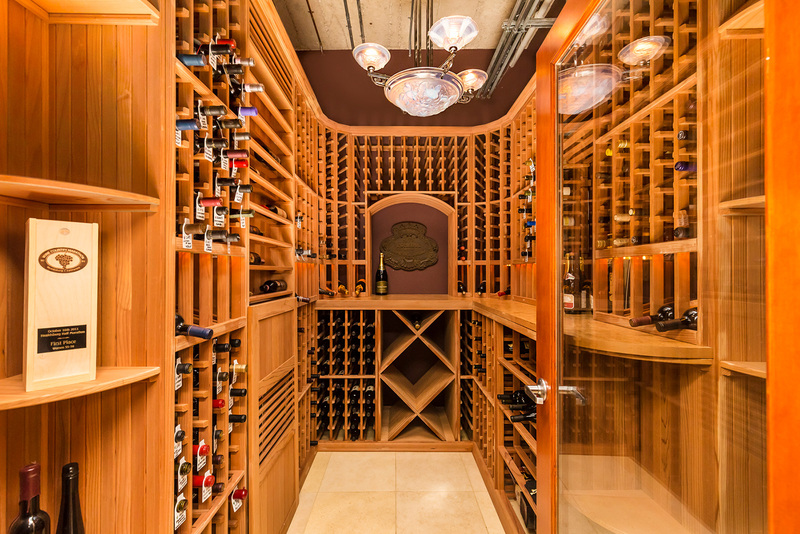 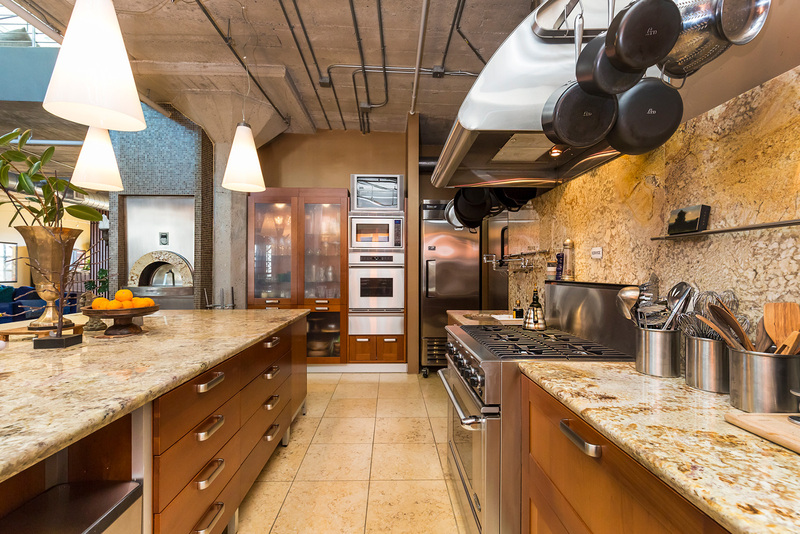 The adjacent chef’s kitchen includes numerous amenities, including an imported wood -burning pizza oven, a 1,000+ bottle cedar wine cellar, and a walk-in pantry with full-sized freezer and “secret” access to the garage stairs. 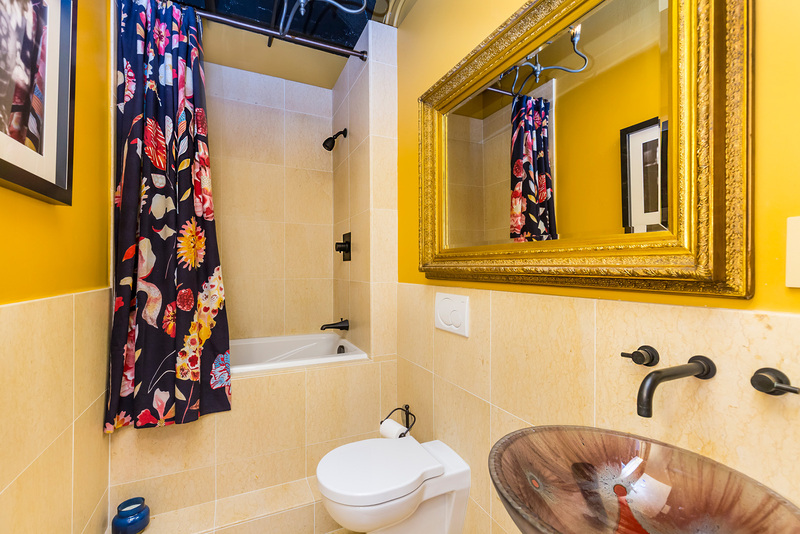 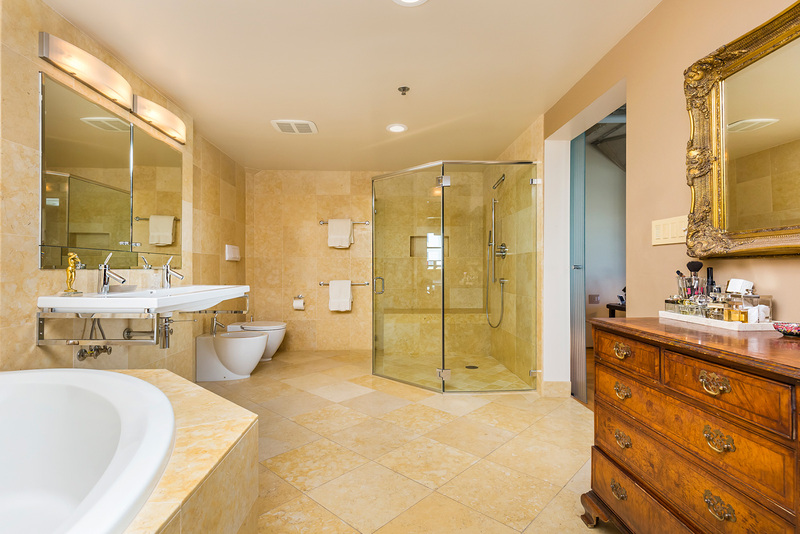 Just off the great room lies the master suite and bathroom, which is highlighted by an oversized soaking tub and a Catalano toilet and bidet, plus a California closet with radiant in-floor heating. 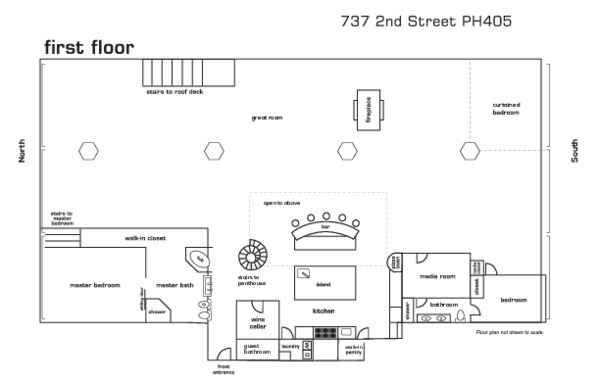 In addition, an enclosed media room with theater sound, a guest suite, and an additional bathroom all lead from the great room. 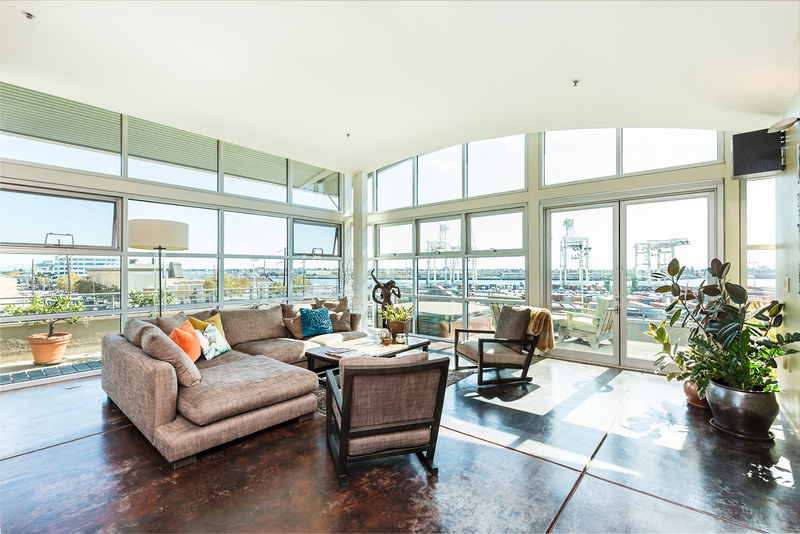 Upstairs, natural light flows through the floor-to-ceiling windows, which showcase panoramic views of downtown Oakland and San Francisco. 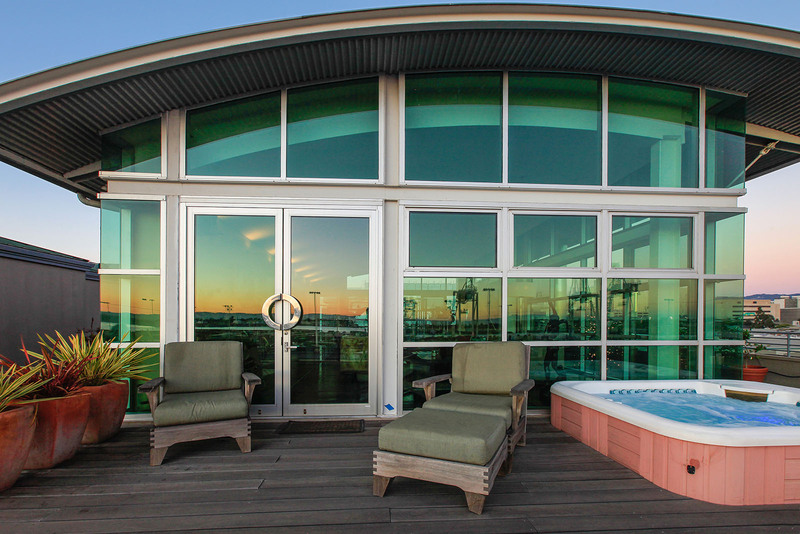 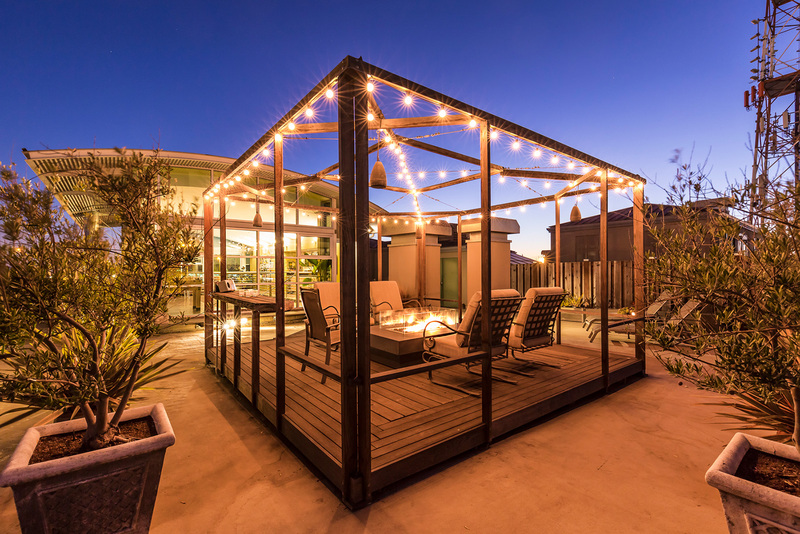 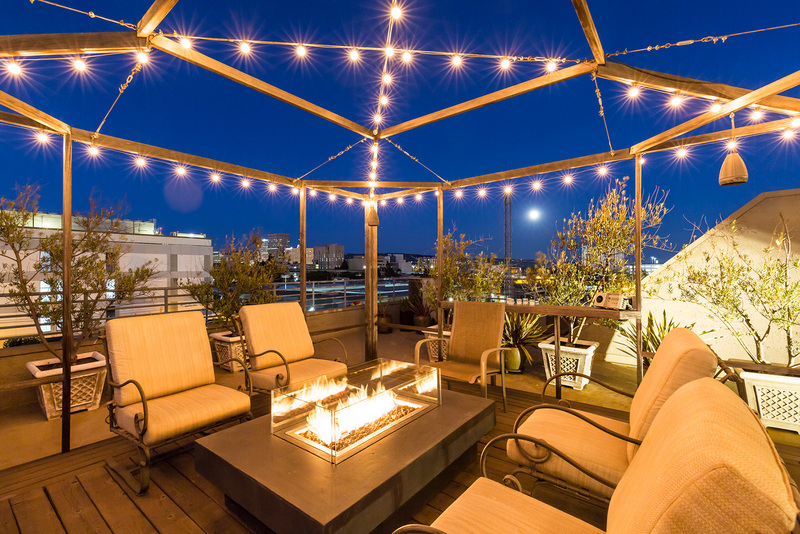 The surrounding roof deck features a pergola, mature citrus and olive trees, and a southwest facing hot tub. 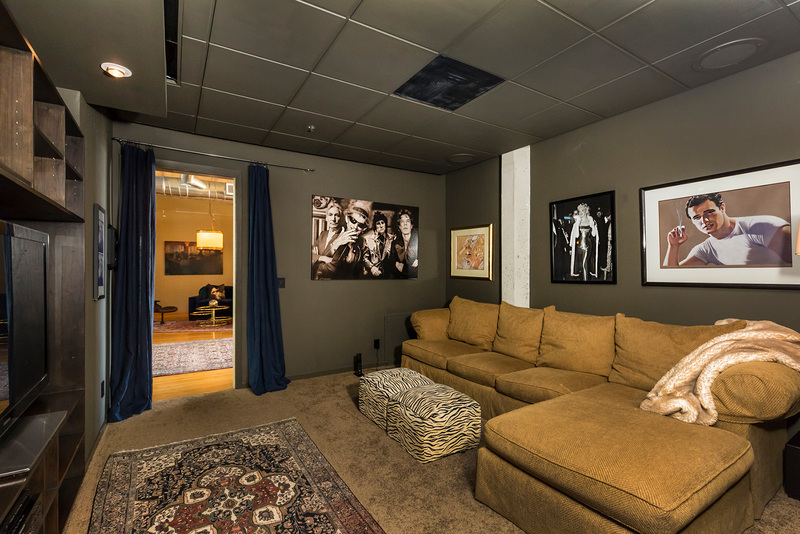 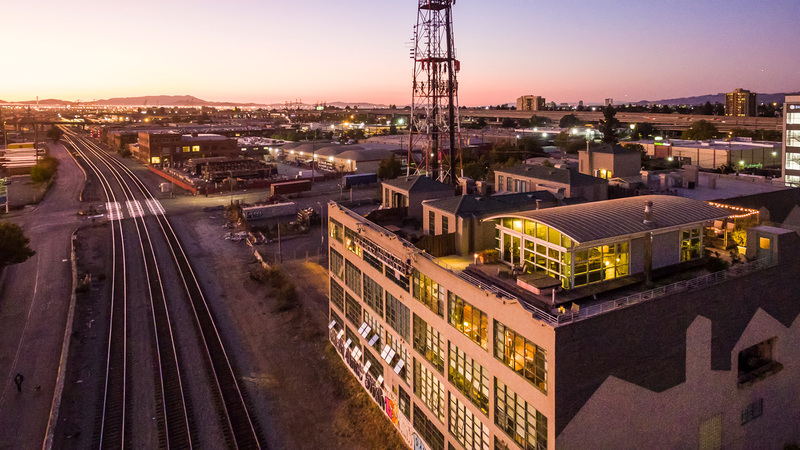 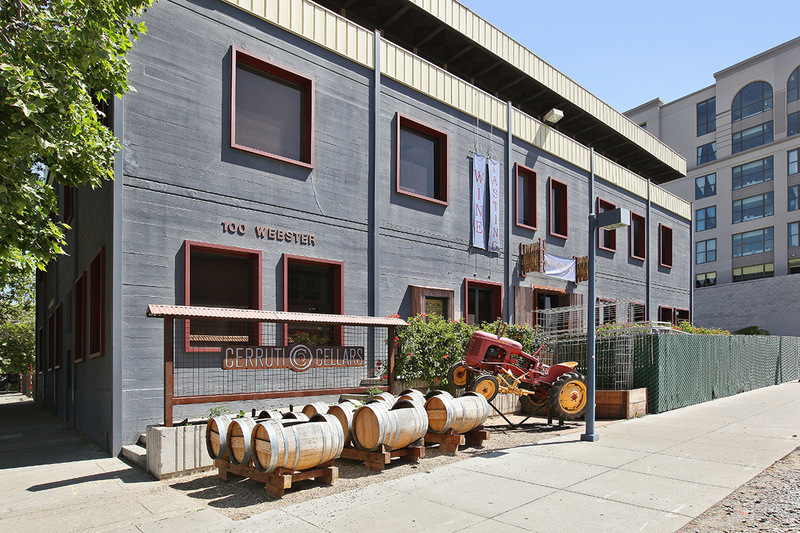 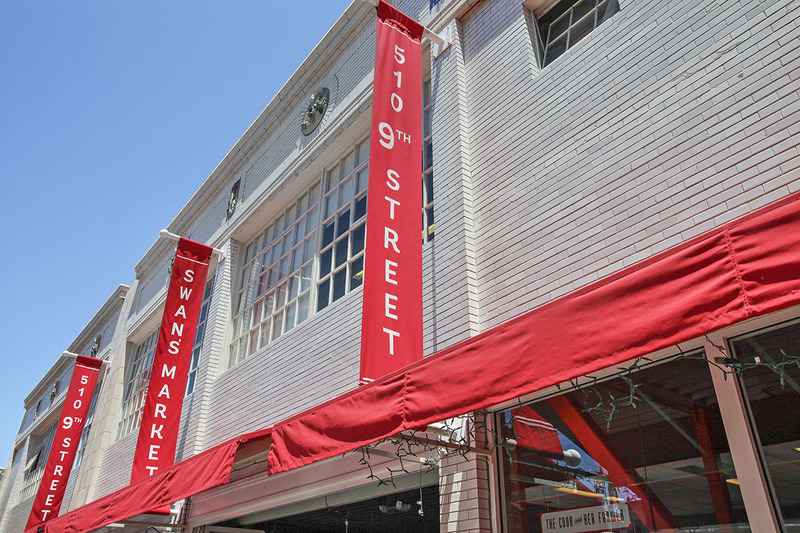 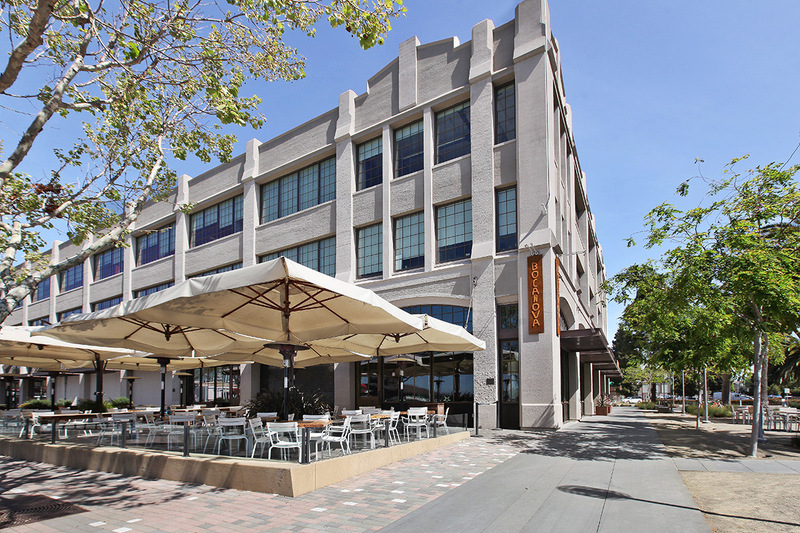 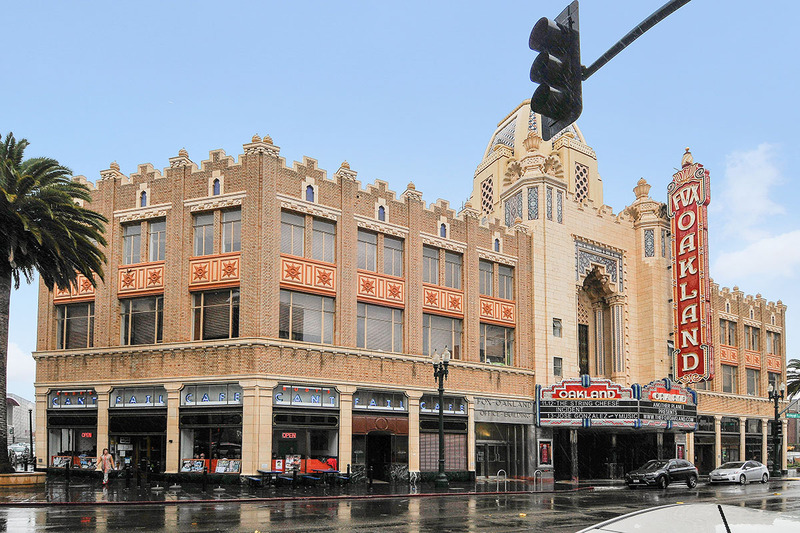 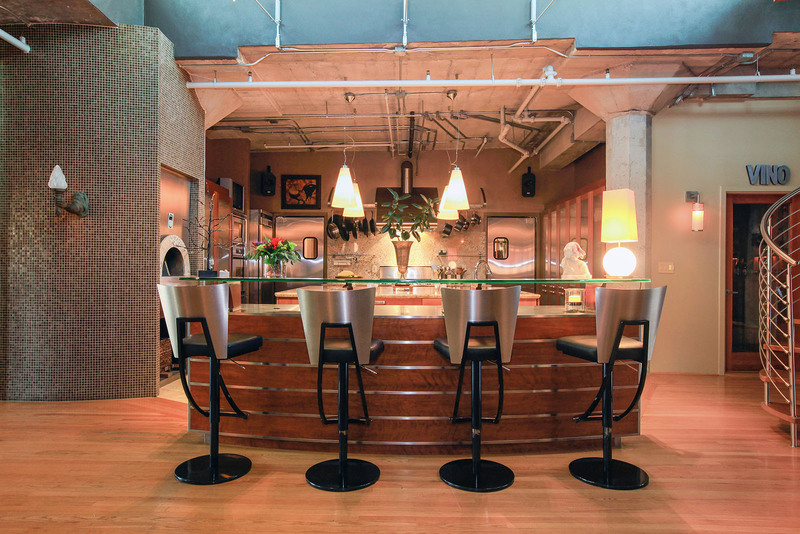 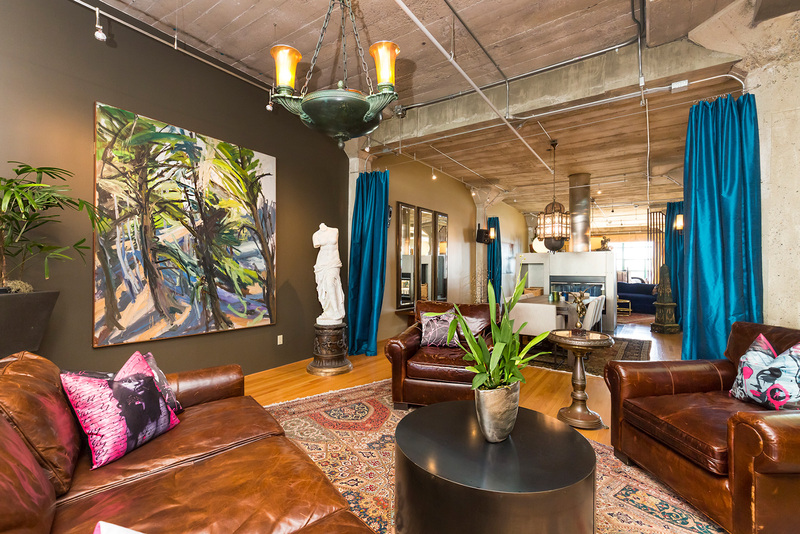 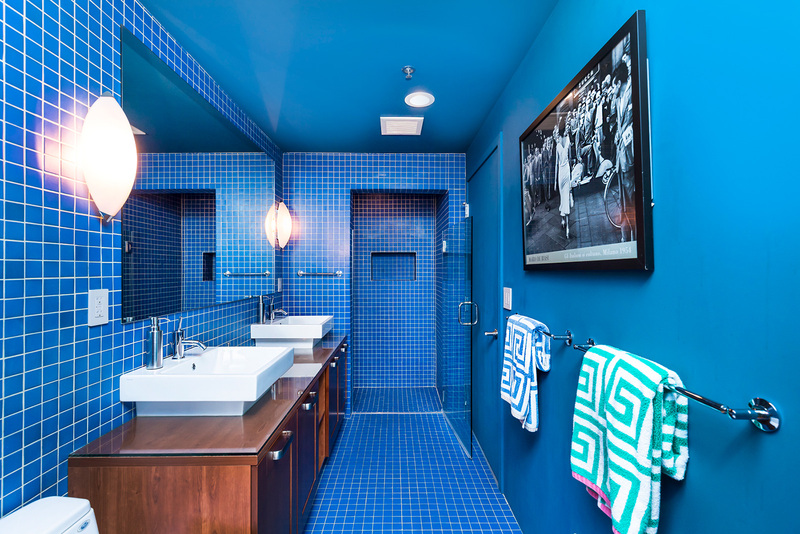 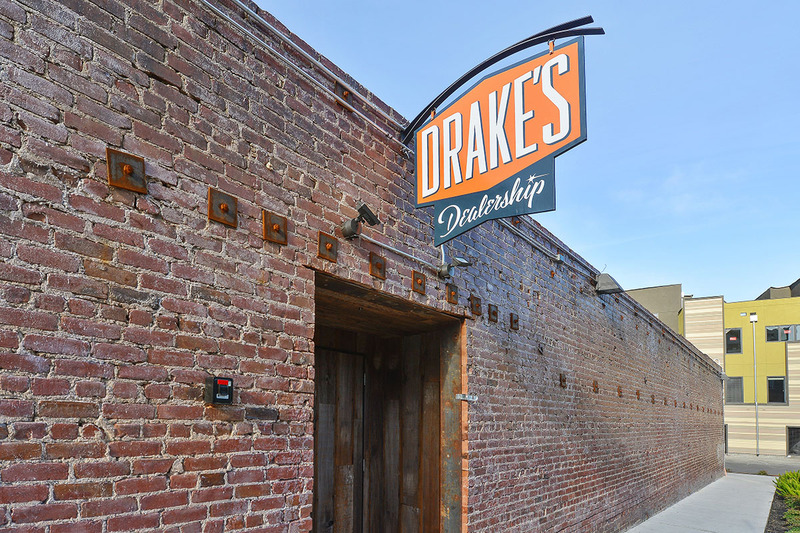 Phoenix Lofts is located just a few blocks from Jack London Cinemas, Yoshi’s, Blue Bottle Coffee and numerous new restaurants and entertainment venues. 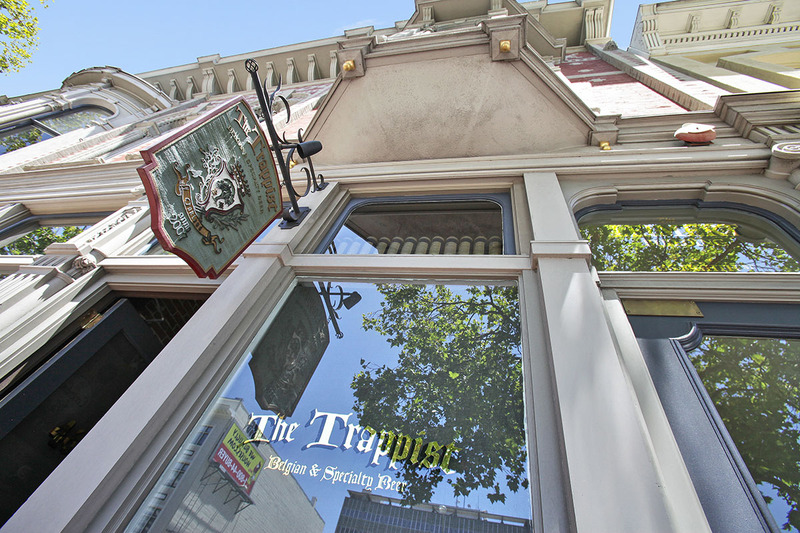 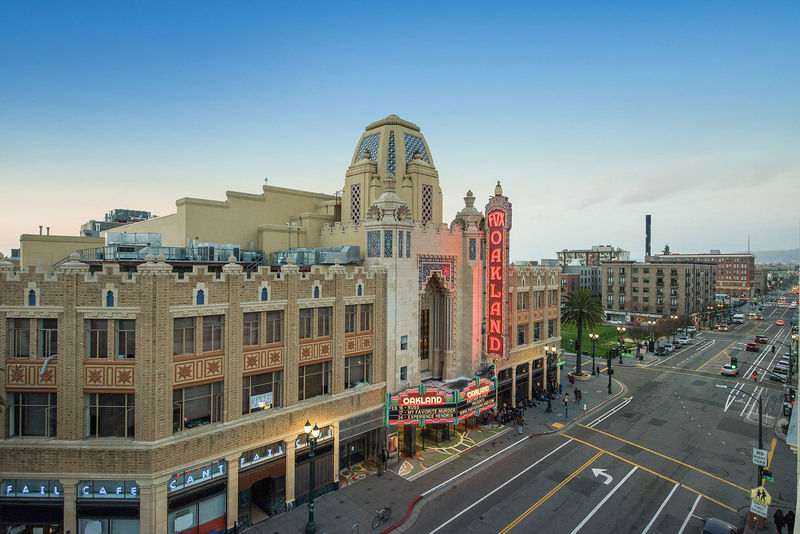 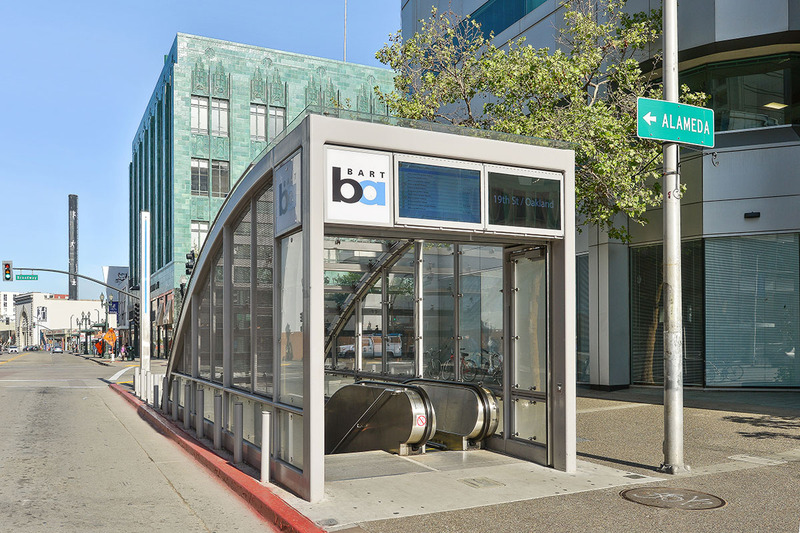 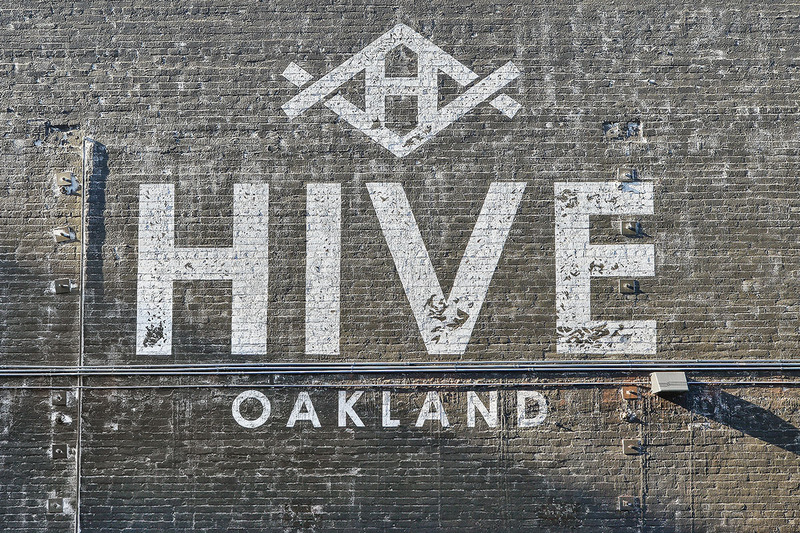 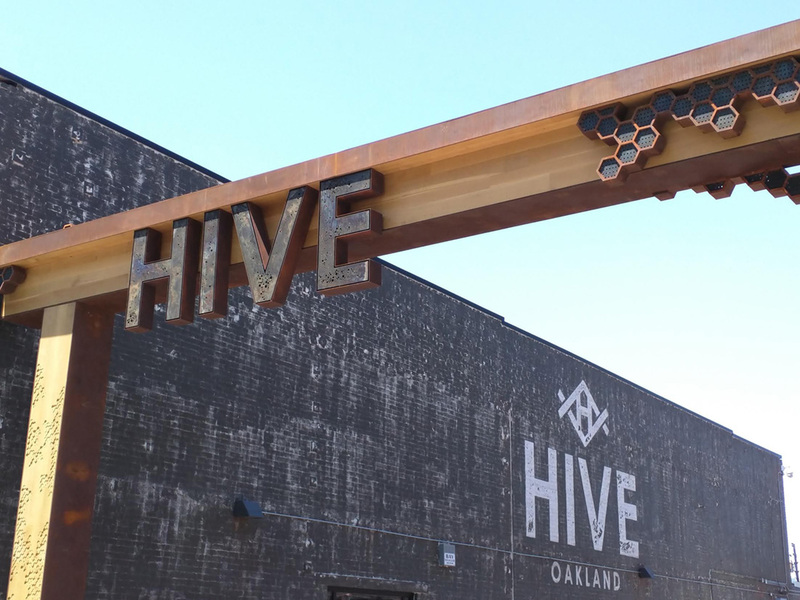 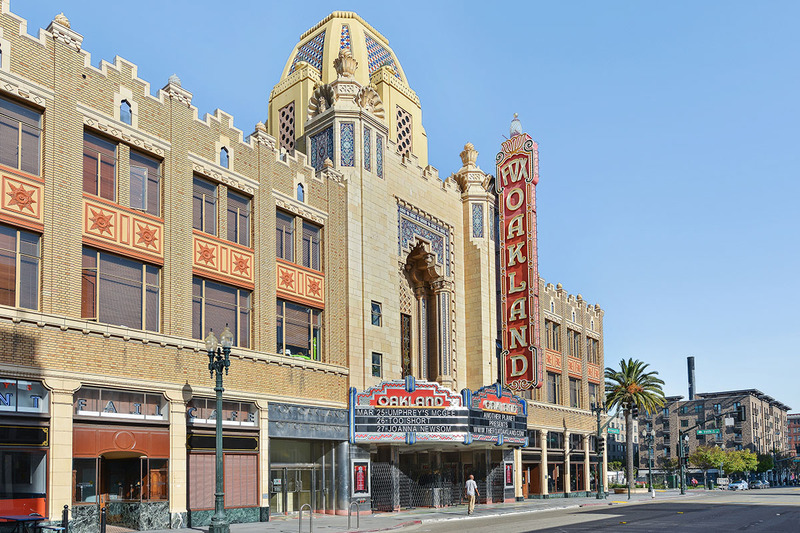 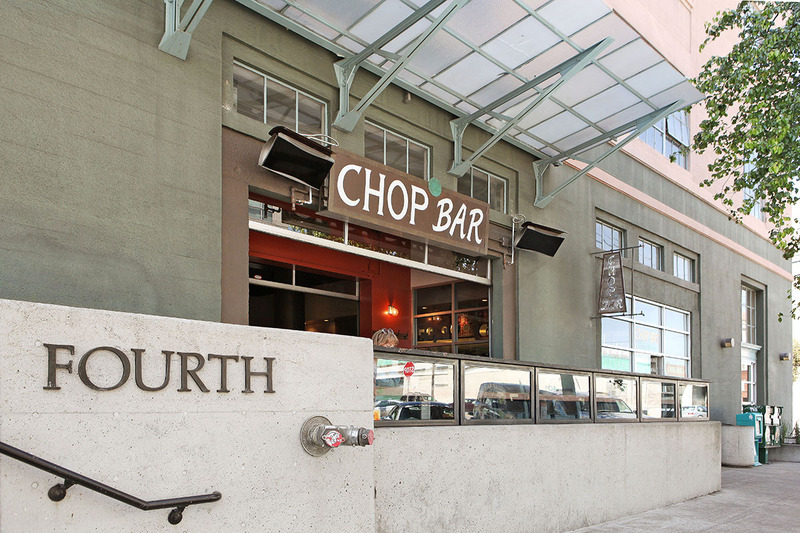 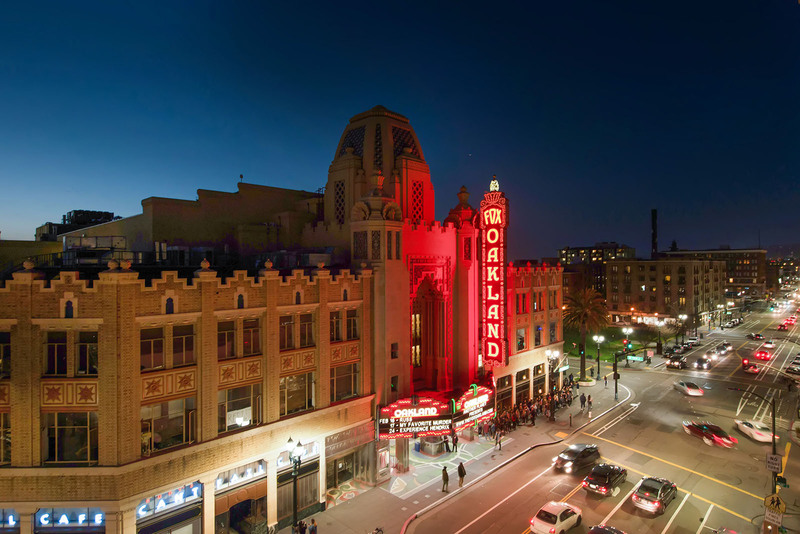 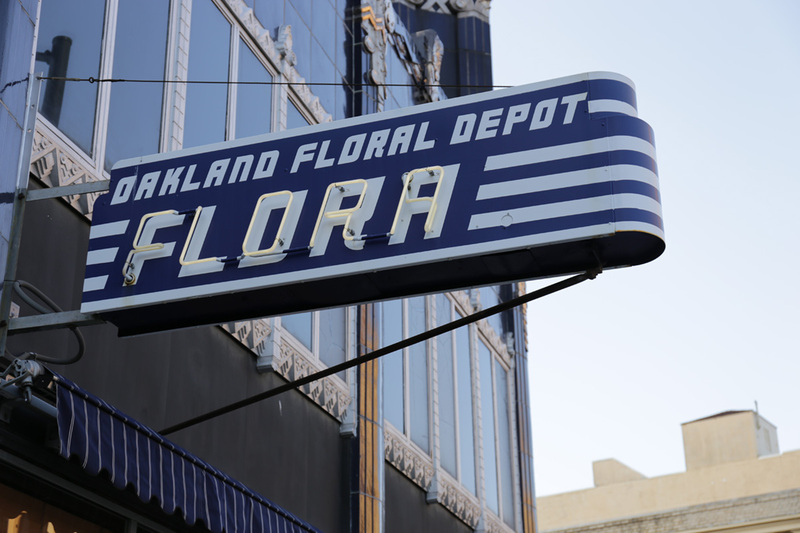 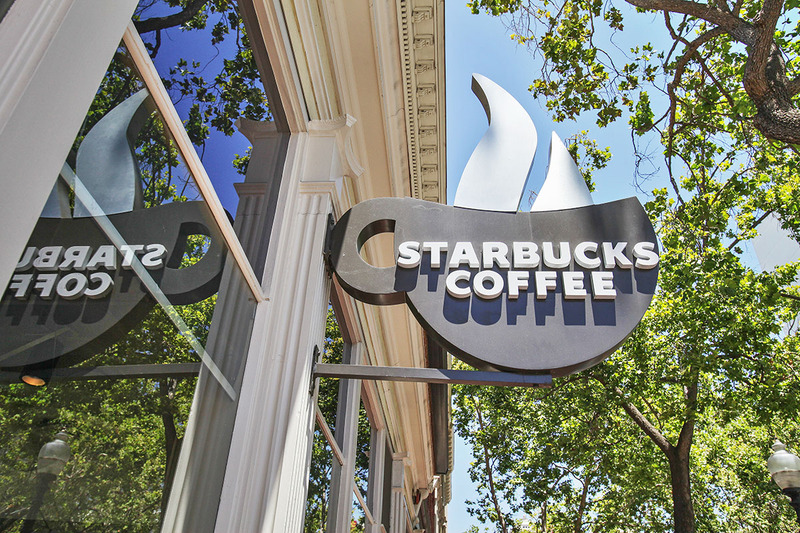 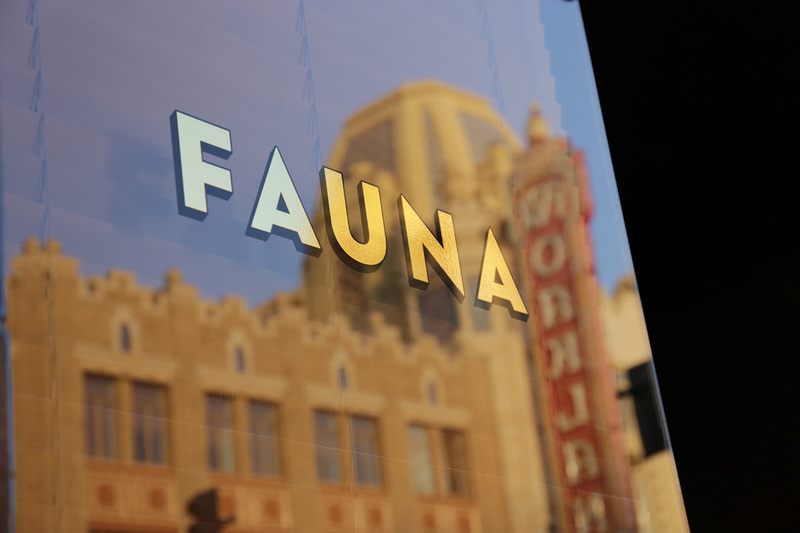 It’s less than a mile from both the 12th Street and the West Oakland BART stations, and it’s only three blocks from the Oakland Ferry Terminal—providing one-stop access to San Francisco. 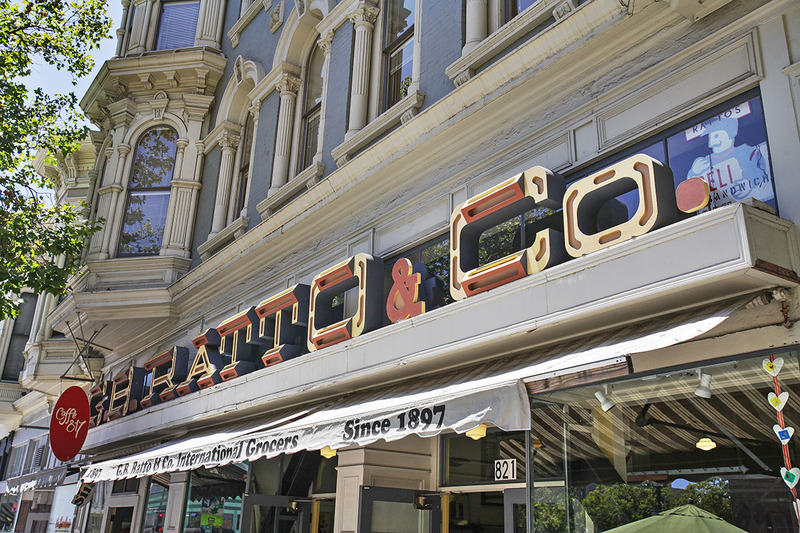 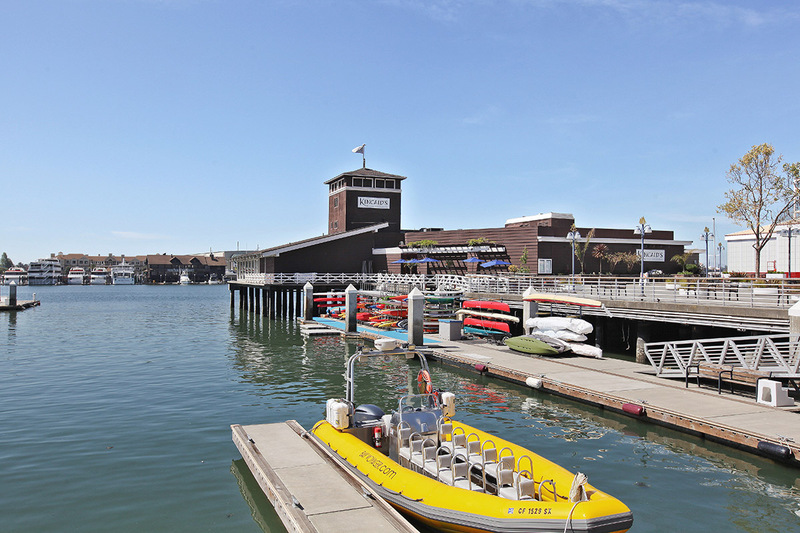 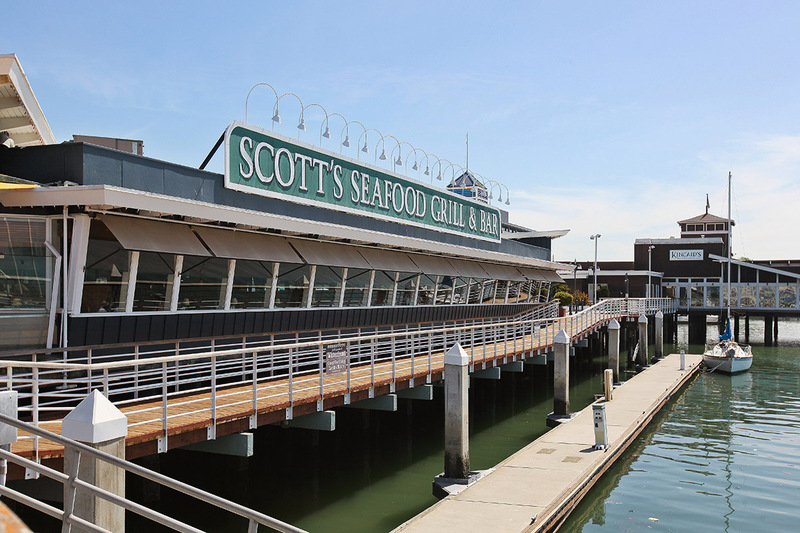 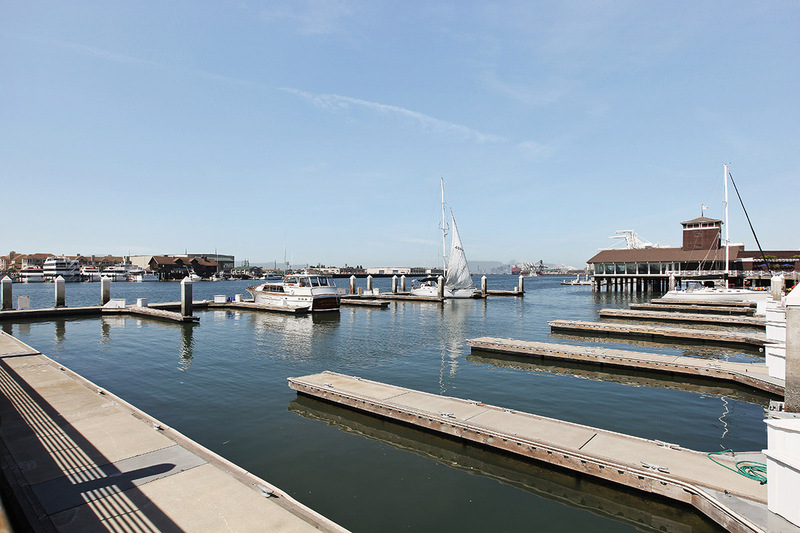 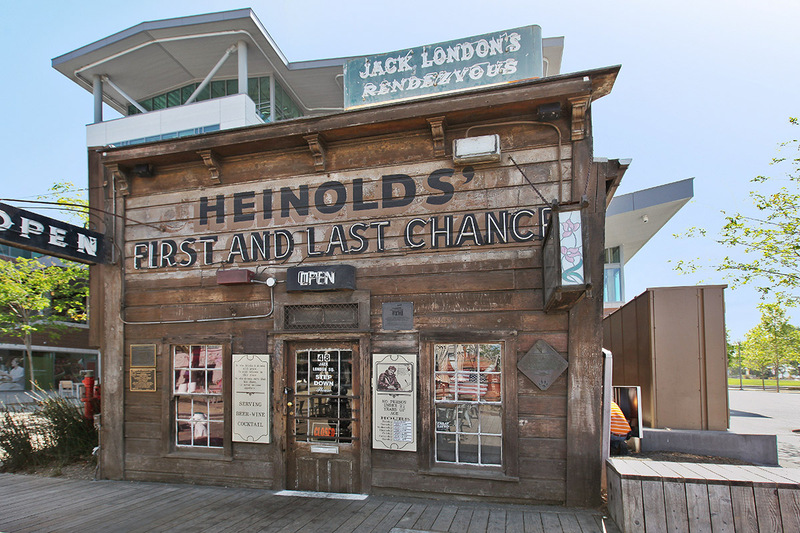 Jack London is a great place to take in Oakland’s waterfront. 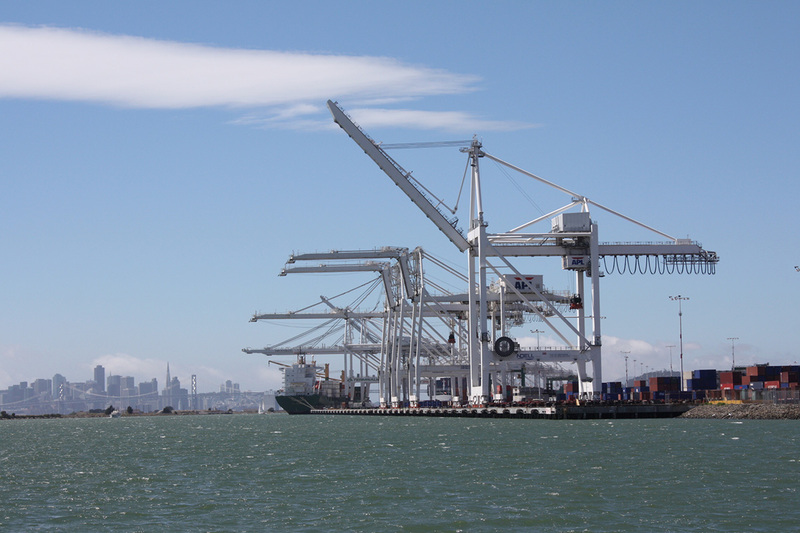 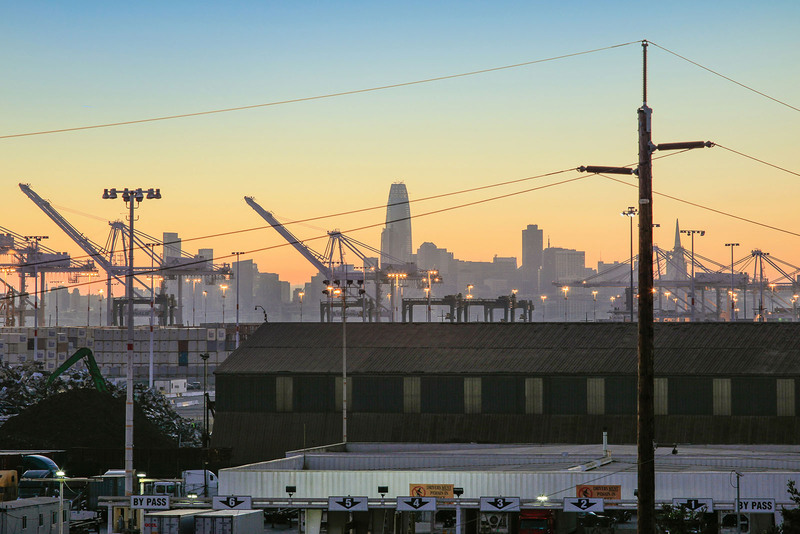 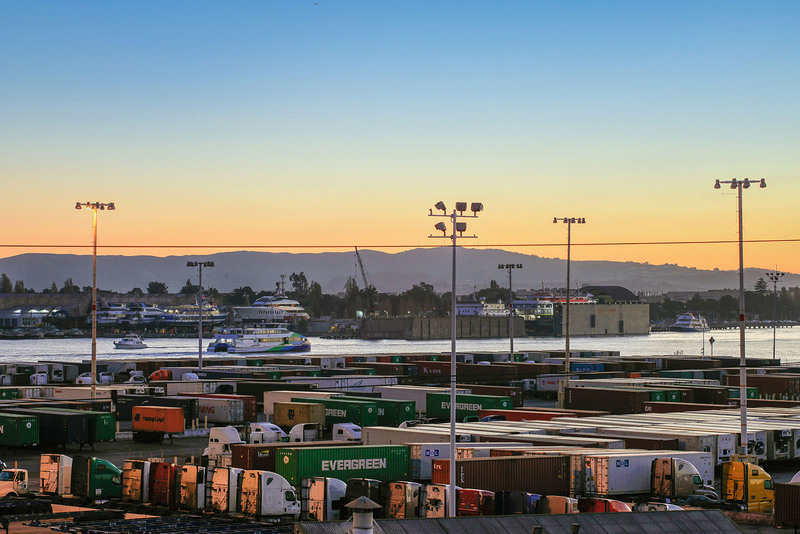 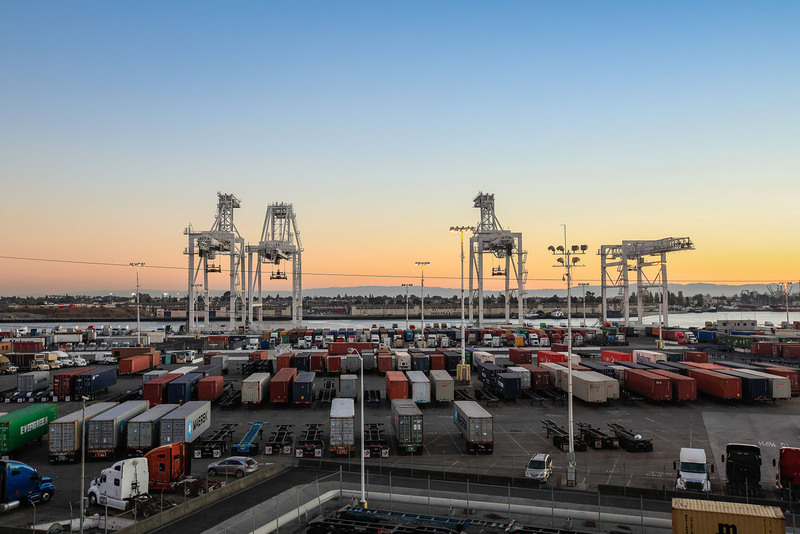 From here, you can see the cranes at one of the busiest ports in the country; take a water taxi to Alameda; or ride a ferry to San Francisco’s Ferry Building, Pier 41, AT&T Park, and Angel Island. 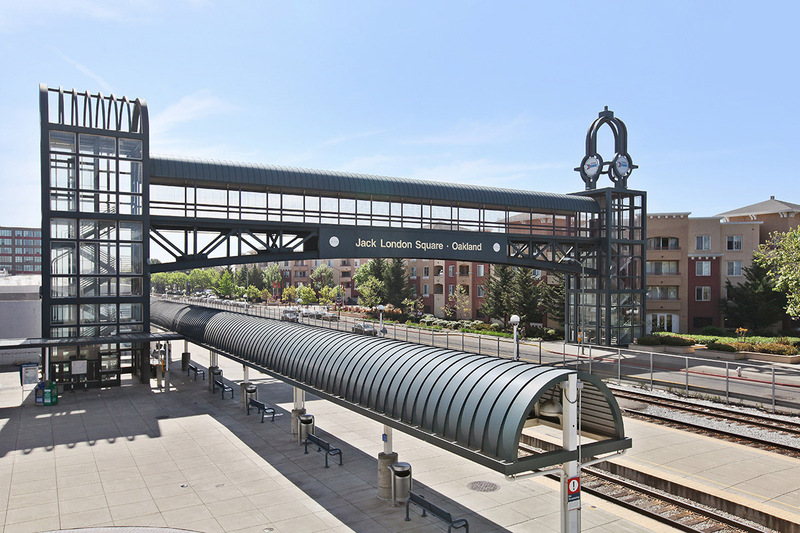 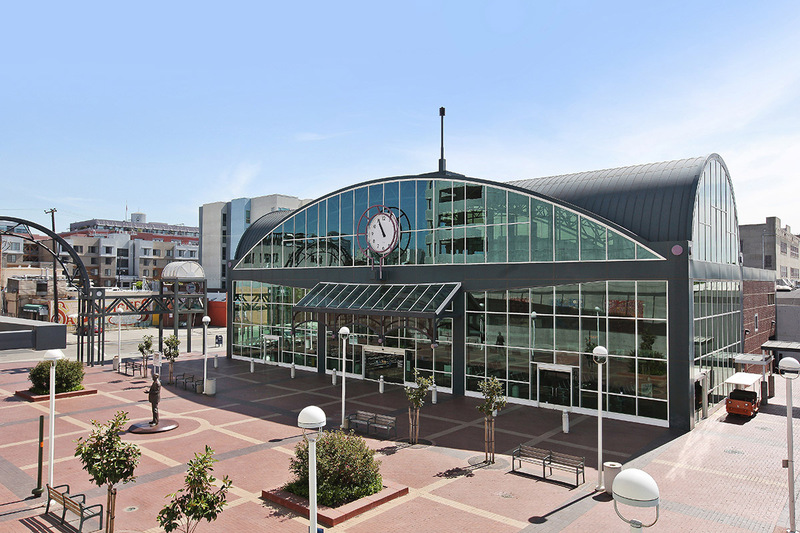 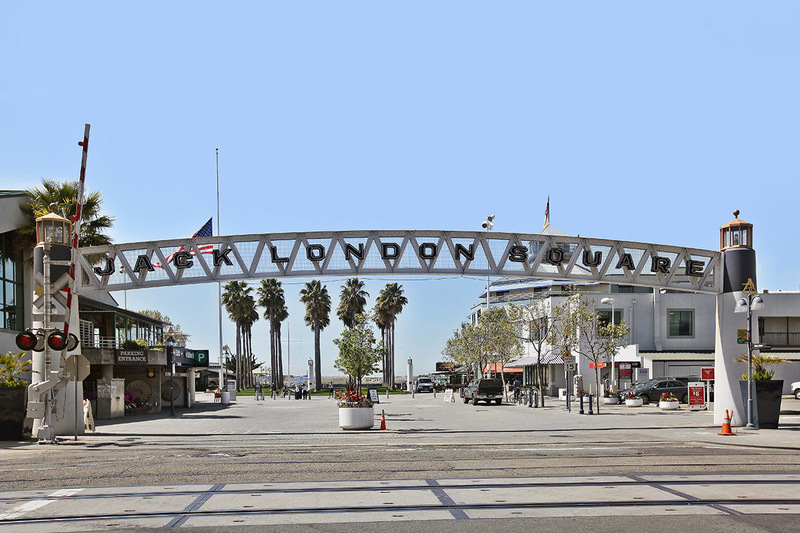 Jack London Square is blocks from downtown Oakland and two Bay Area Rapid Transit (BART) lines, close to Interstates 880 and 980, and home to an Amtrak station and Transbay Ferry. 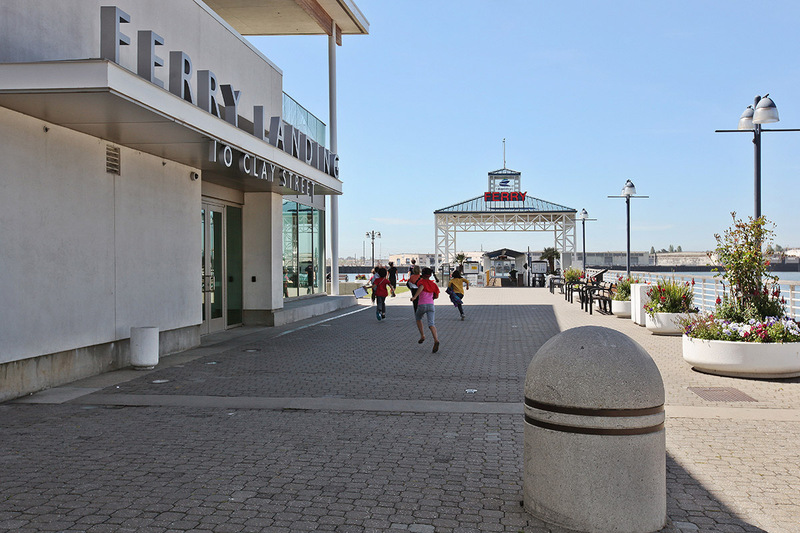 It is also the hub of a thriving commercial business and retail district. 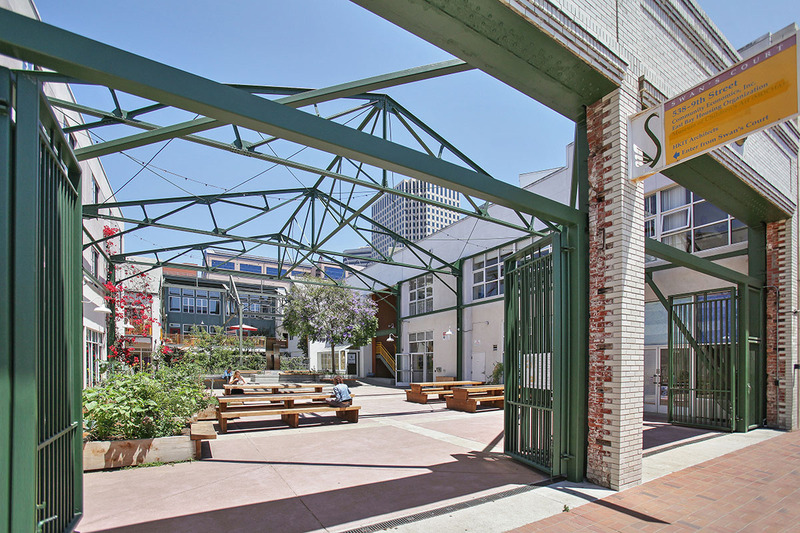 There’s a farmers market on Sundays and special events like the yearly Eat Real Festival. 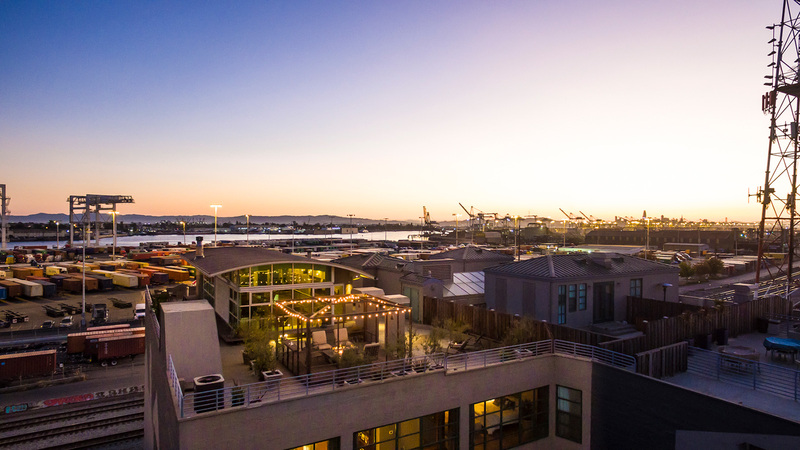 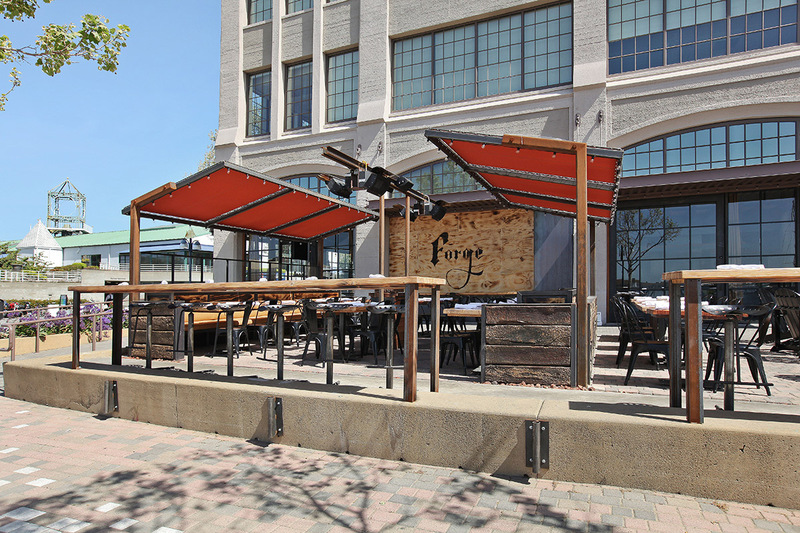 Hotels, bars, restaurants, and office space all have a place along this urban waterfront development. 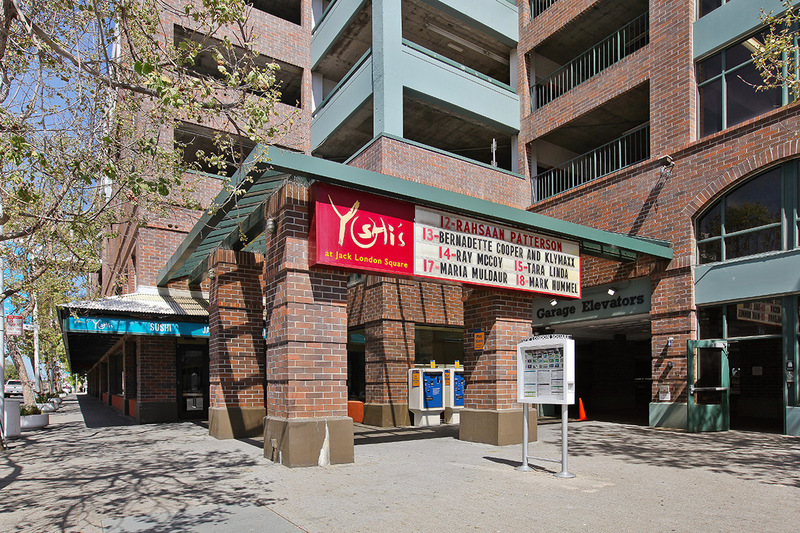 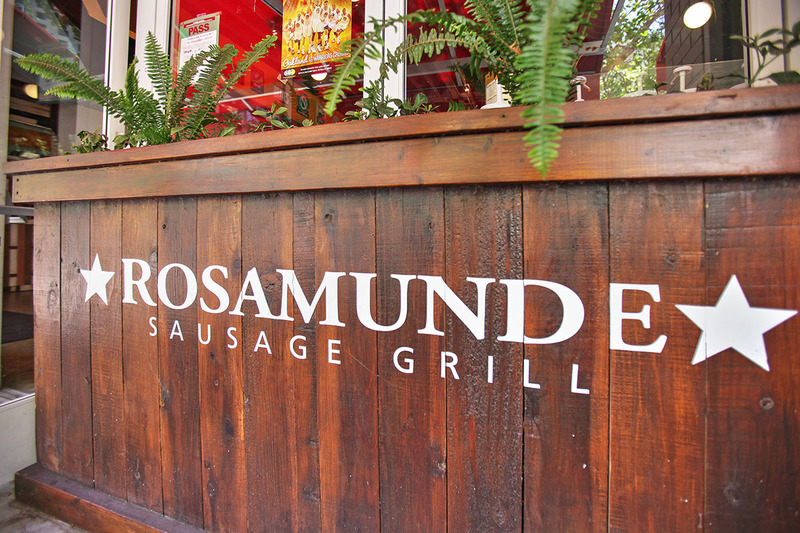 The place to catch the best jazz in the world is at Yoshi’s, a restaurant and nightclub.